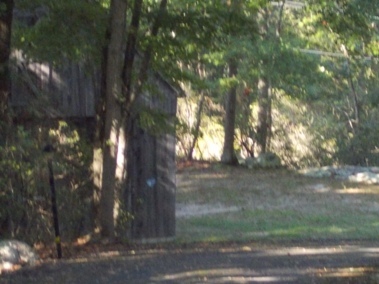 I bought Marionette in 1995 from the Connecticut River Museum in Essex, Connecticut. 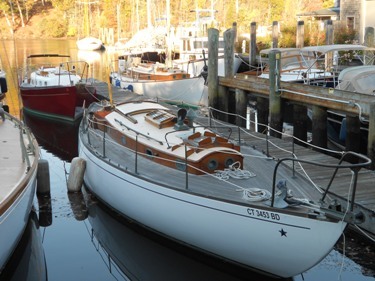 After 10 years on the hard in a small nearby marina, she had been donated for the Museum’s annual fund raising Thanksgiving auction. The minimum bid was $2000 and no one bid for her. 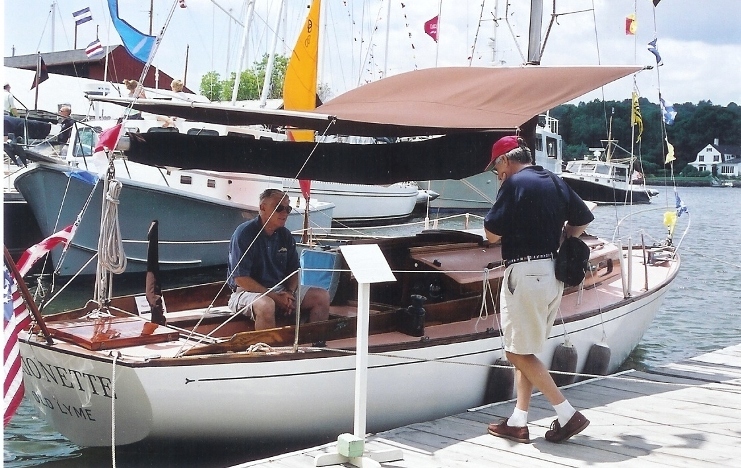 Here she is, at left, all dressed up at Mystic Seaport in 2004 for the Sparkman & Stephens' 75th Anniversary as representative for the Dolphin 24 Class. WARNING: There is a lot of detail here - more than anyone, other than a minutia starved Dolphin owner, could ever endure. 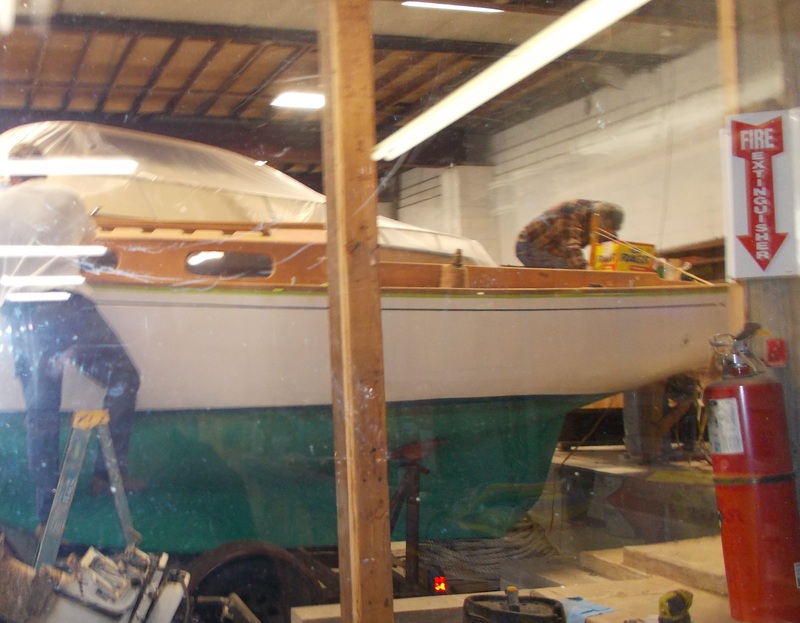 I had retired early from the ‘game’ and was riding around the Essex boat yards looking for a boat to buy and restore - one that I could single hand and maybe race occasionally. Despite the dim light :-) I liked her lines, so I found a ladder nearby and climbed aboard. 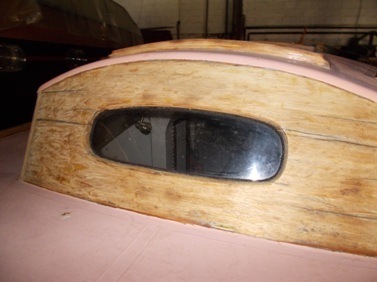 The hatch was open, the sole was wet and rain water had half filled the bilge. 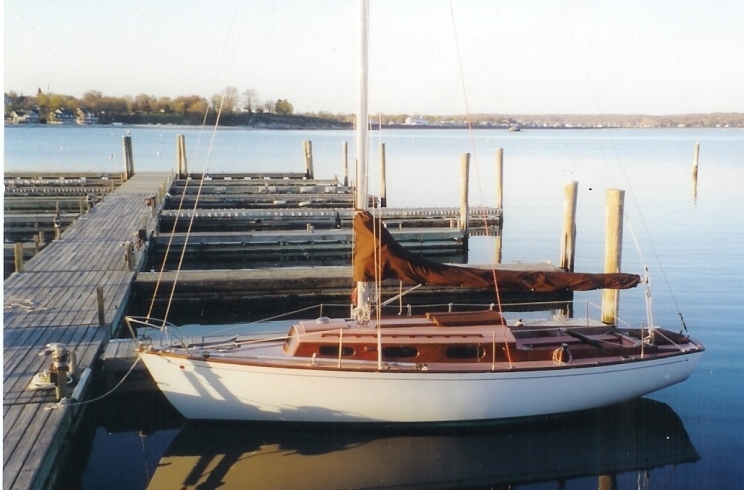 I found a hand pump in a seat locker, pumped her dry, crawled around the deck, fixed the tarp, went below, sat on the starboard settee and looked around. So began Marionette's new life. 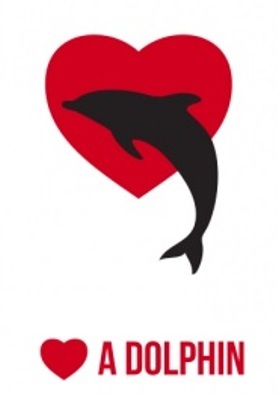 “before you go any further, I am a former Dolphin owner myself and I know that, sooner or later, someone will come by who knows what a Dolphin is, and will recognize what a good value this boat is for $2000. We are not going to take a penny less”. So, I bit my lip and said I’ll take her. For this Director's story, click here. 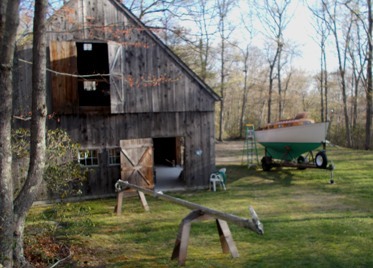 Hull # 12's guy was a Phil Zerega, an engineer who had no prior boat building experience. 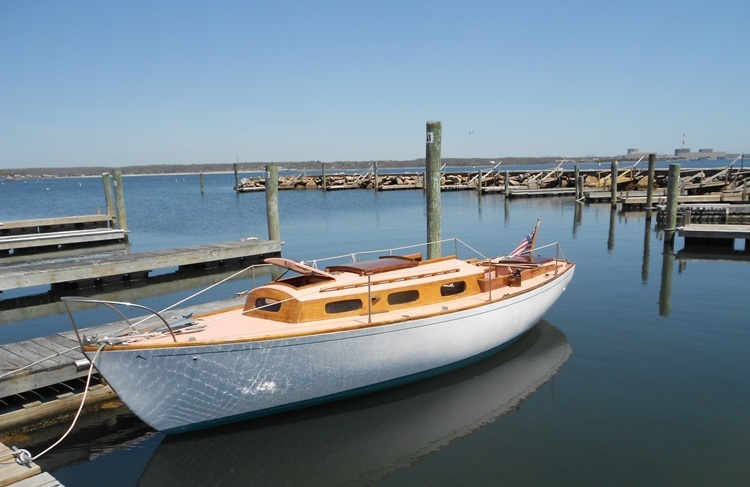 Sometime in the summer/fall of 1960 he borrowed a trailer and picked up the bare hull at the plant, the 2 half hulls now bonded together, and brought her home to Southport, CT. He named her Teal and propped her up on poppits under a ridgepole and tarp. 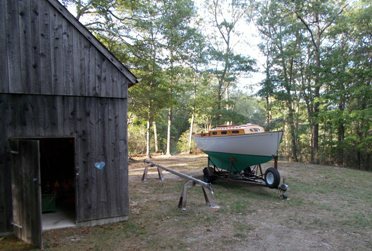 Then over the fall and winter months he built a beautiful wood boat on that shell - to me an amazing feat. I had always meant to track Phil down and talk to him but never got around to it. The decision to go forward with this website made this mandatory. After several weeks of searching I found Phil and finally got to talk with him. Gradually, I got the story of how he did it. His Teal was launched August 12, 1961. Phil's son Mark stopped by the house to deliver some pictures of TEAL and her construction. Click here to see them. Phil Zerega sold Teal to Jim Rice in/about 1966. 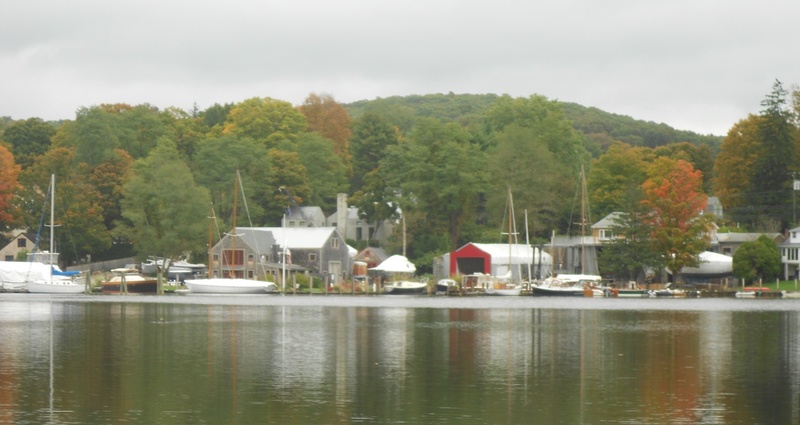 Jim belonged to the Essex YC on the Connecticut River in Essex, Connecticut. 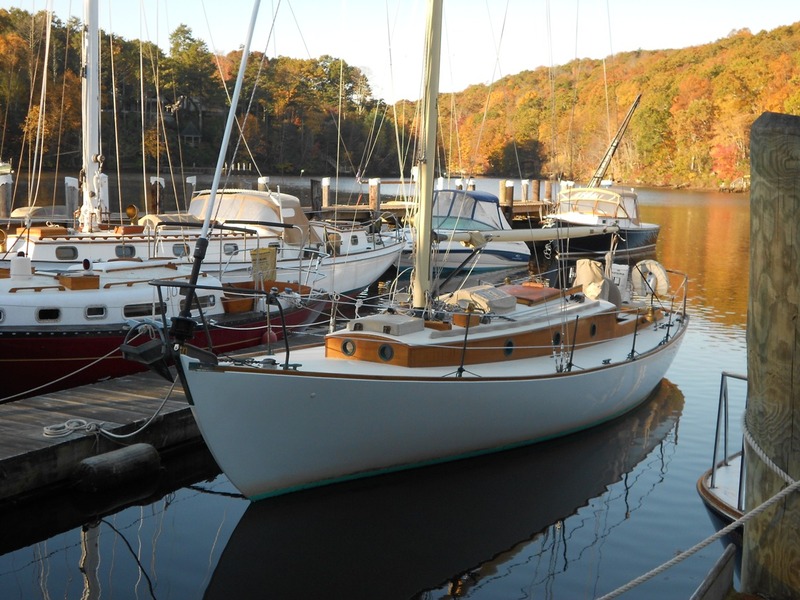 A couple of years after he bought the boat Jim decided to move up to a Tartan 27 (known in some circles as a 'big Dolphin) and sold her to a couple of friends, one of whom was named Watt, and who lived in Cos Cob, in western Connecticut. The friends did not get along and, a year or 2 later, they decided to sell the boat. 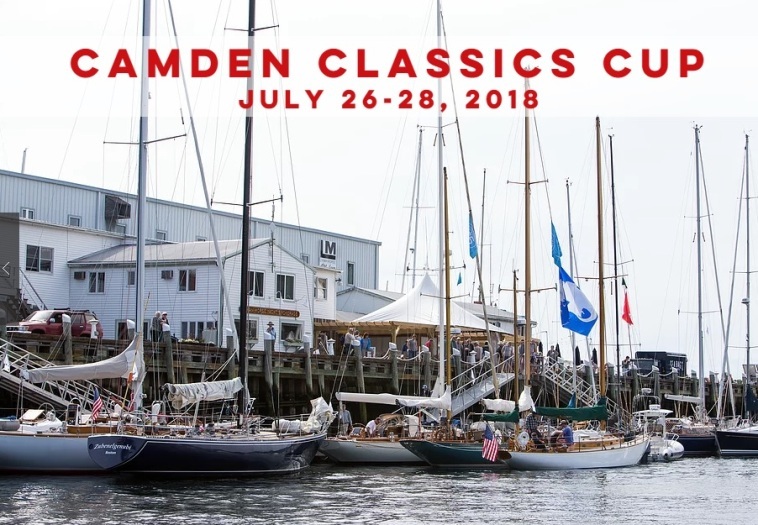 Tom Marstand, a good friend of Jim Rice, had a South Coast 23 at the time, and raced with the guys at Sachem's Head YC - where there were 5 or 6 Dolphins. He told me he got tired of always finishing 2nd to one or the other of those Dolphins and decided to buy Dubhe. He went down to Cos Cob in 1970(?) and sailed her home. He changed her name to Marionette. 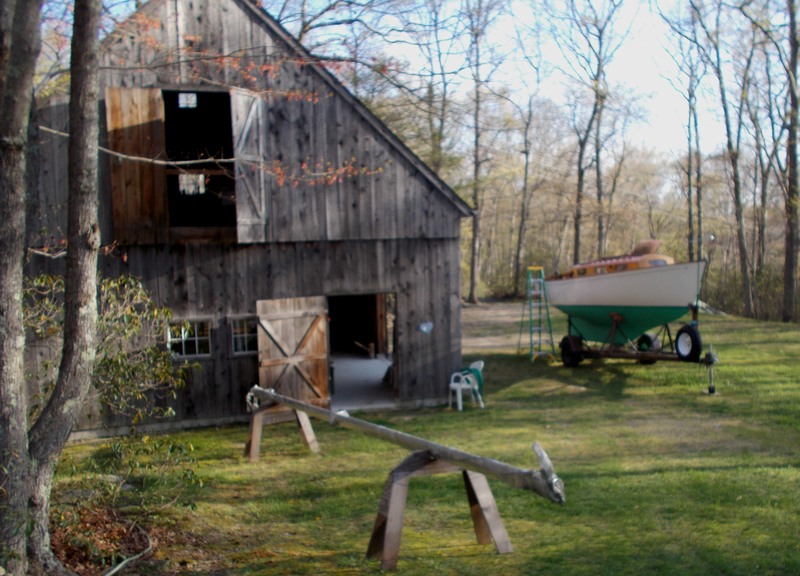 Tom was a carpenter at Essex Boat Works and his skills were a perfect match for Marionette's hy-bred construction - a wood boat on a fiberglass hull. 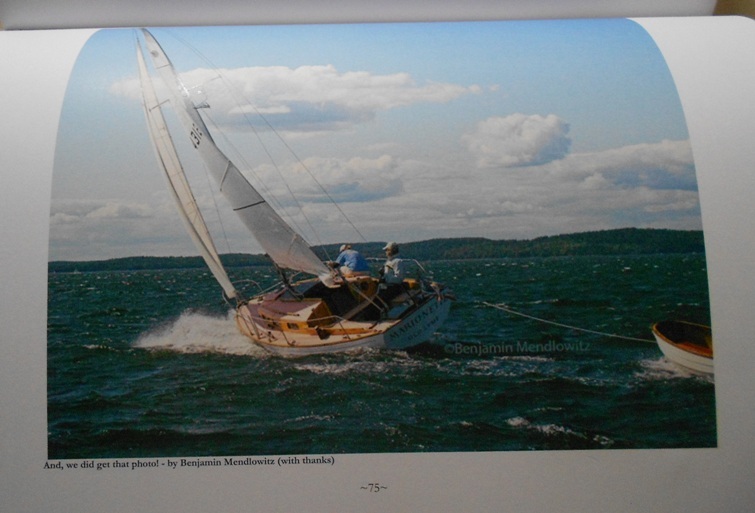 He raced her successfully for about 12 years, winning the Off Soundings Club Charles Koch Trophy in 1980. 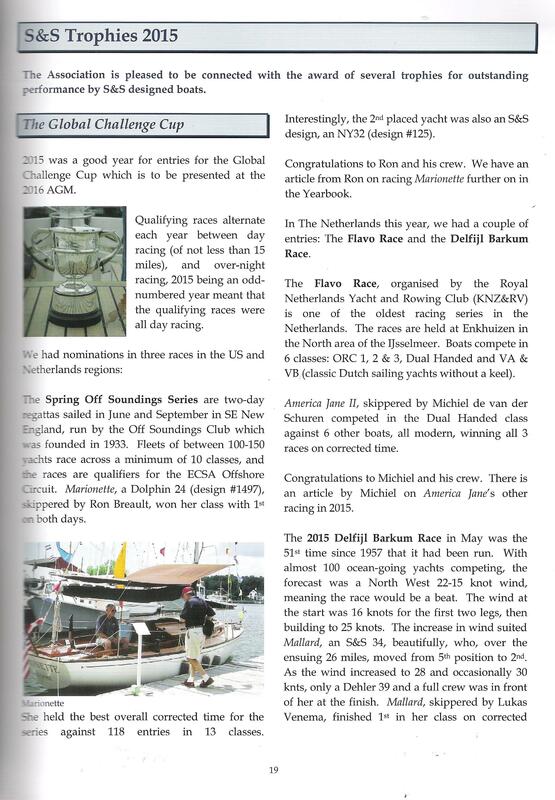 Dolphin 24 owners of that era were 'connected' to small boat racing, in particular the International 14. 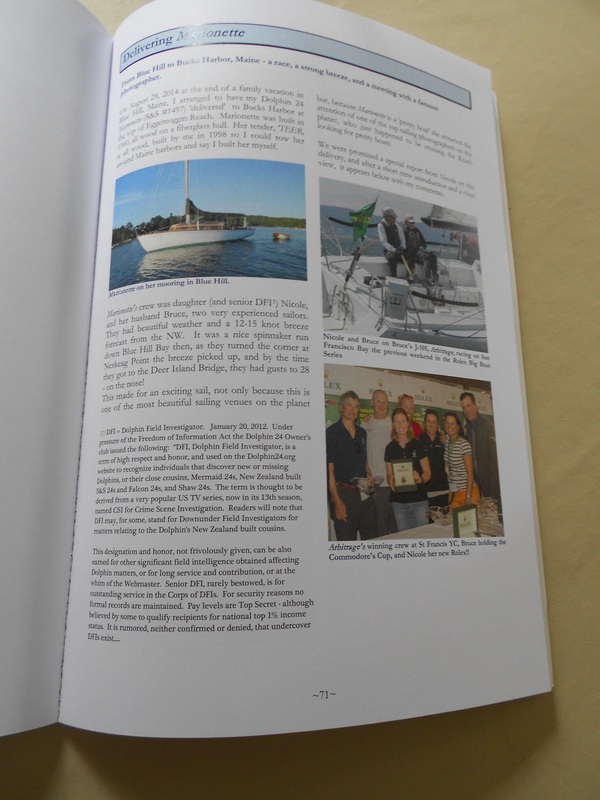 Along with George O'Day, Tom was a contributing author to Stuart Walker's book The Techniques of Small Boat Racing by the International 14 sailors of North America. Click here for that fascinating story. And click here for Tom's chapter on Tide and Current. 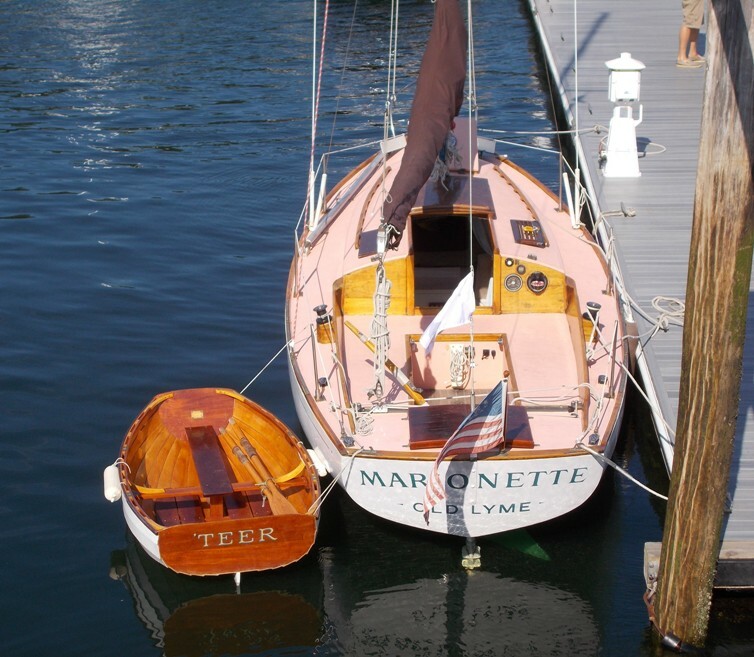 Tom sold Marionette to a friend in the early 1980's who sailed her only one year before 'retiring her to a small marina in Old Saybrook, CT - where she sat for at least 10 years. 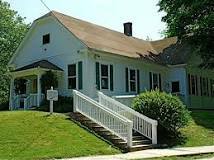 Eventually, she was donated to the Connecticut River Museum in Essex where your webmaster found her in 1995. So, here we are. My 1995 restoration goal was simple. 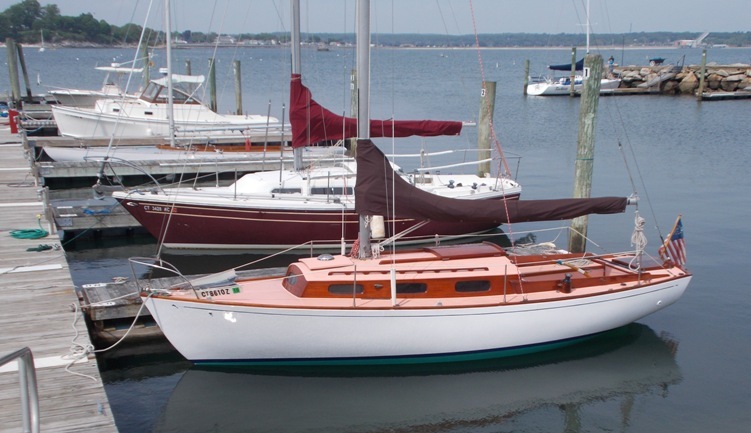 Set her up for single handed cruising and short handed racing, with weight control and traditional appearance major considerations. 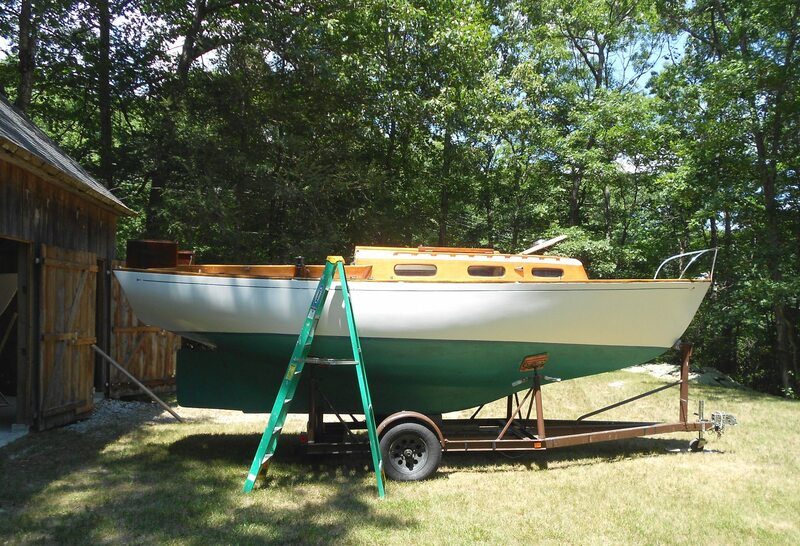 Cost considerations were in the mix but this is a relative thing – having got her for $2000 means the minimal initial investment expense can forever be used as a defense against the inevitable “in house” complaints about where this restoration project is going. And, remember, your significant other will not be able to contain her remorse at her earlier recriminations when she, at anchor with you on a late summer afternoon in West Harbor (Fishers Island), Cuttyhunk , Nantucket, or Camden, Maine (I’ll get to those Great Lakes, southern and west coast equivalent haunts when you Yankee and Pacific Dolphin owners tell me about them) and, sipping her nicely chilled Chardonnay, watches another couple, motoring in their dinghy to the dock from their 40’ gleaming white, $400K Odyssey Princess or whatever, change course to pass by your stern to say those famous Dolphin words - ‘Pretty Boat”! Priceless. Webmaster Note: There are other acceptable terms besides "Pretty Boat" that convey this sentiment, although this is by far the most used - its true, it 'fits', not pretentious, and my favorite. Click here for another version of this message. I do not have a "before" picture, and I did not take 'restoration' pictures - this will get me in big trouble with the webmaster lurking behind a tree some 12 years later. 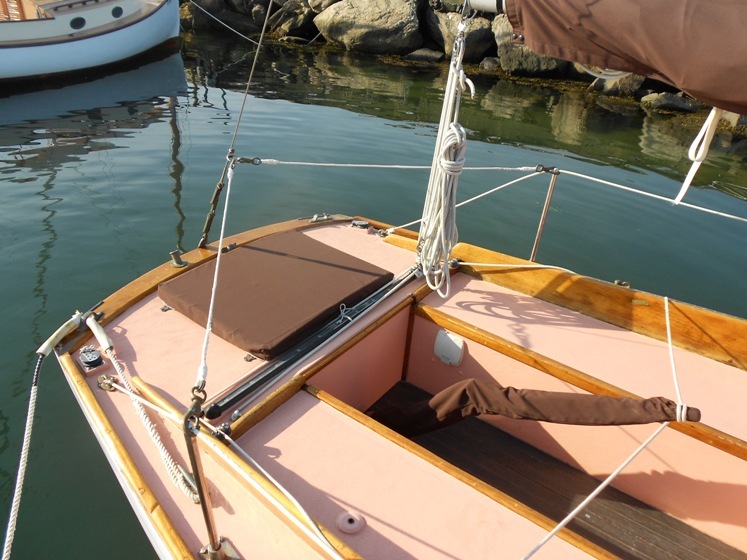 Marionette has a solid mahogany cabin trunk varnished inside and out, with mahogany combings, toe rail, handrails, winch pads and cockpit trim. 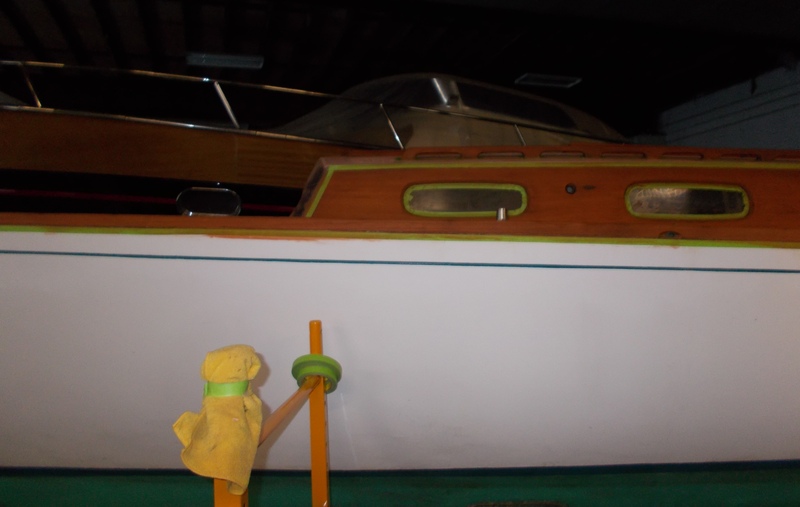 The plywood deck and top of the cabin were dynel covered and there were rips in places when I got her. 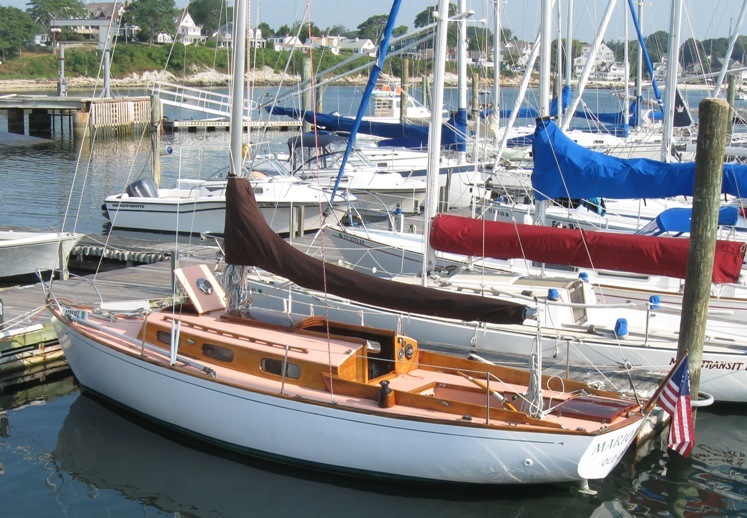 She has a large main hatch and a two panel hatch in the transom deck – both made of mahogany plywood with mahogany trim, and a painted plywood forehatch. 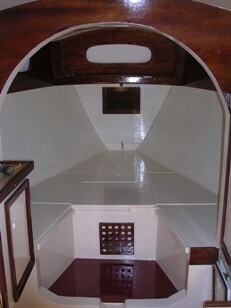 The transom locker inside has a molded opening in the hull for an outboard, storage space on either side for gas tanks, a sealed bulkhead separating it from the quarter berths, a removable panel separating the locker from the cockpit, and a heavy plug that fits neatly in the hull opening for when the outboard is not in use. The panel stores on the side of the cockpit well when access is needed to the engine. More on the transom locker and engine related stuff later. 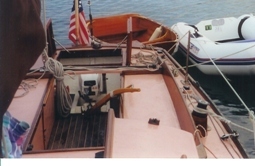 She had bronze genoa track on top of her toe rail and old style bronze winches mounted on built up mahogany pads outside of and bolted to the combing. This boat has no stern pulpit – which I like. She can race without one under the ‘grandfather’ clause. 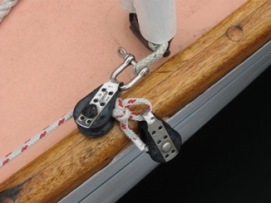 I have a heavy ring mounted on the backstay to which I can, and do as racing conditions warrant, or when single handing, connect snap shackle fitted lifelines from the aft stanchions. I installed a new ball bearing traveler with control blocks and cam cleats so that it can be controlled from the weather side. I kept the old heavy, bronze, folding double handle, back stay adjuster but one day I might change this to a multipart block system adjustable from the cockpit – when I can figure out 1) a satisfactory way to lead the control lines back to the cockpit without making too many holes in the deck, 2) without messing up the rear deck hatch and traveler, and 3) still be able to easily adjust the backstay while sitting on either the port or starboard side. Meanwhile, the adjustable back stay stays mostly unadjusted…This picture also shows the Autohelm 1000 custom bracket (more later) and the pin socket where the Autohelm mounts. 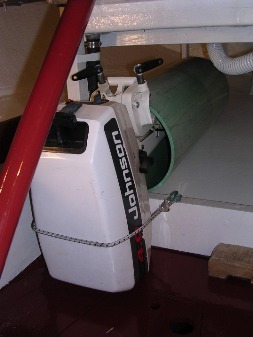 I use a 4hp Johnson 2 cycle outboard that, when not in use, is stored, prop end in first, in a 4 foot long, 12” diameter, heavy wall plastic drainage pipe located under the bridge deck/cockpit and fastened to the starboard side quarter berth locker wall. The mounting screws on the motor can clamp the head to the pipe but this is not necessary as I use a heavy shock cord which is all I need.. 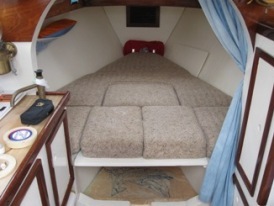 Coupled with the companionway step system we have – discussed later – this storage system has been very satisfactory. 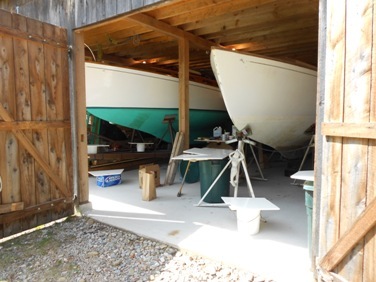 Click here to see a more detailed discussion of the motor storage, companionway steps, bridgedeck lockers, electric panel and cooler which are all in this same area. The motor, which I also use as a dinghy motor when cruising, weighs 32 lbs and with its Power Prop drives the boat at 4.7 knots, no headwind and flat water. 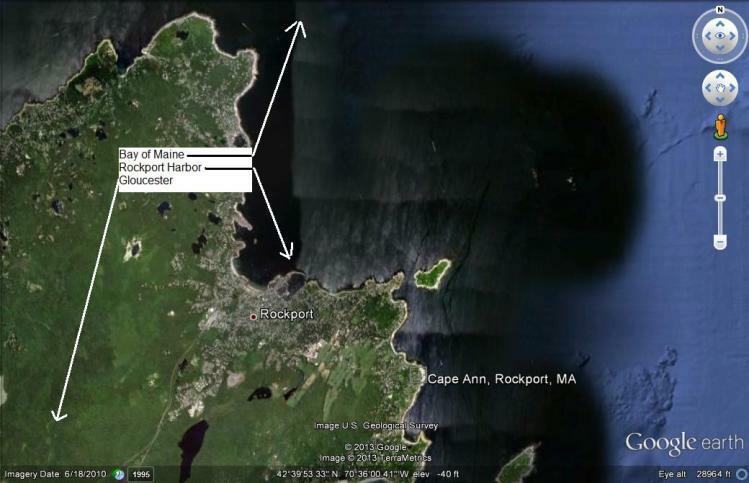 This meets the Off Soundings Club rule that the auxiliary power be capable of driving the boat at 80% of hull speed in these conditions – it does, just. A 3 gal tank I use for racing runs for 5 hours at full throttle. Subject to conditions I use 20 nm as the planning range. I have two 3 gallon and two 6 gallon plastic tanks. 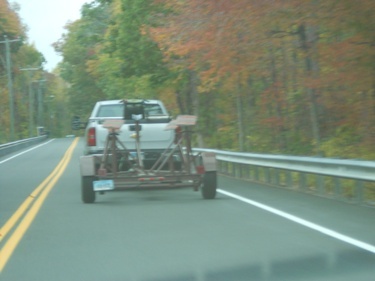 When cruising I usually carry a 3 gallon and a 6 gallon tank that store on either side of the transom locker. The 3 gallon tank is easy to move into the dinghy. 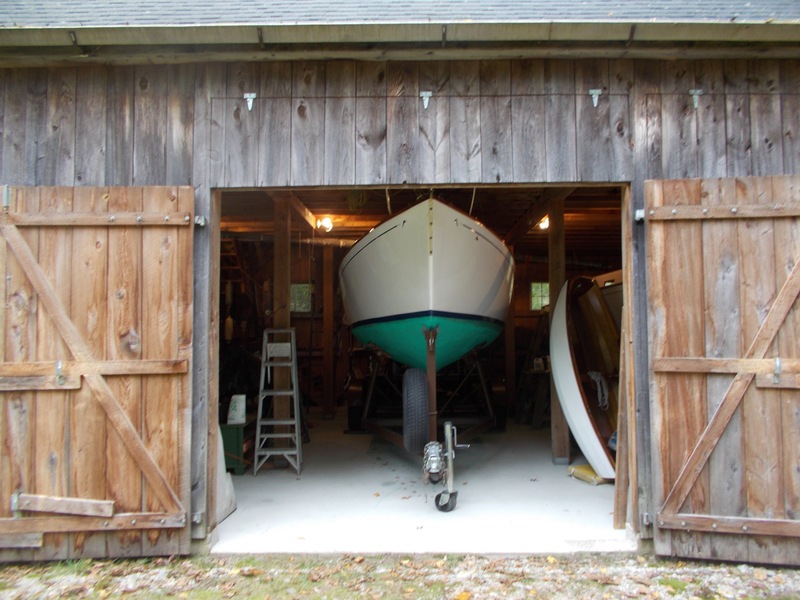 Click here for a larger view and more on the transom locker and hatch, engine mount and plug. I could have bought a long shaft motor, and sometimes I wish I had, but since I planned to use the motor as a dinghy motor as well, another compromise had to be made. (There have been subsequent developments in Marionette's motor program - click here to go there) I can reverse if I have to by twisting the motor but I, and my back, have never regretted not purchasing a motor with a reverse gear – an extra 33 lbs! I have many times wished I had an inboard, and many times have been glad I don’t have one. 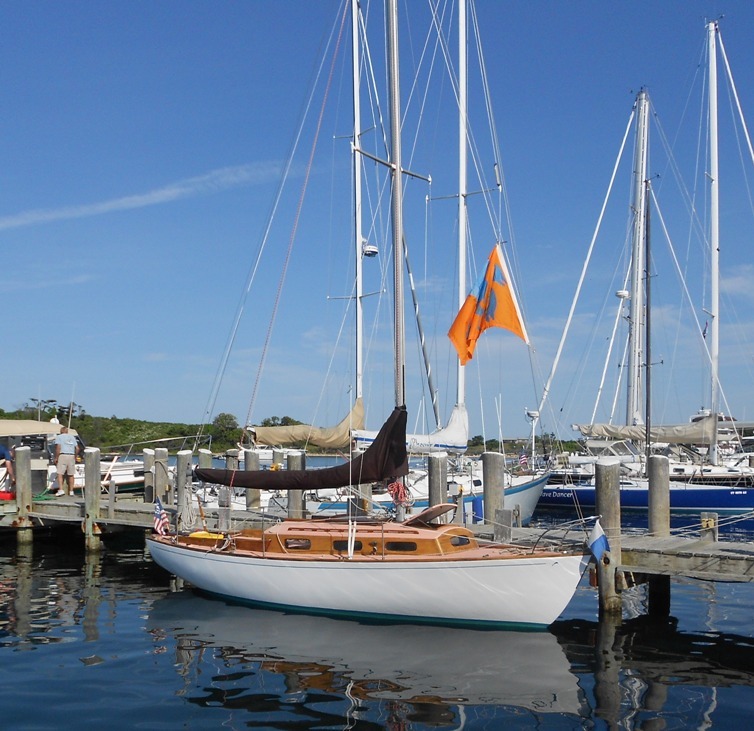 I raced Atlantics for nearly 20 years – they are Starling Burgess designed classic 30 footers and don’t have any auxiliary power. (For more on Atlantics click here) I am comfortable with sailing in and out of slips – guests and observers are often less enthusiastic. Anyway, Marionette made the decision for me – she did not have an inboard. A brand new light diesel installed is the cost of a 2 week vacation in Provence where the red ocher cliffs are – more on this later. 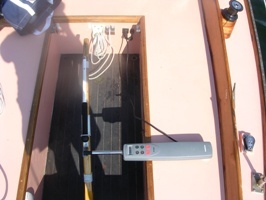 I have an Autopilot ST1000+ (above left) that mounts on a pin that fits to an almost flush mounting pad in the starboard seat and connects to the tiller via a custom bracket (click for a close up view and more info of this system). Otto is a great crew, a best friend, works well, is reliable and does not drink my beer. He gets his juice from a 12 volt outlet in back of the bridge deck. I have been known to inadvertently kick the cord out of its socket but nothing is perfect. The location of the outlet facilitates use of the 12 volt spotlight - that I never use. I also have a portable spotlight - that I rarely use. The control line for the centerboard winch exits at the back of the bridge deck (above right), through a cam cleat with the excess line stored over a winch handle holder mounted right next to it. The jib sheets are led from the winches to cam cleats mounted on the inside edge of the cockpit seats making tacking and sheet adjustments for a single hander, or even when racing with crew, very easy. The bronze winches, as nice as they were, weigh a ton and were replaced with Lewmar #8s. I bought these new at a Defender’s back room sale for $75 - the pair! Sometimes I wish I had the next larger size, self tailing, and double speed, but when I think this I remember that I should have already changed to a smaller jib! 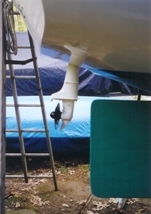 Large Harken spinnaker turning blocks are mounted on pads near the transom corners and genoa turning blocks further forward. 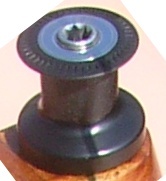 Sliding Garhauer SS track blocks mount on the bronze toe rail outboard track. Unfortunately this track does not run past the forward edge of the combing. so when reaching with a genoa the lead cannot be moved forward past this spot. Someday I’ll fix this. 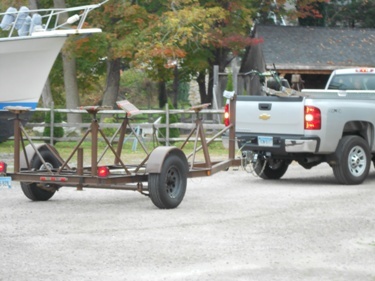 For more on jib/genoa tracks, click here. 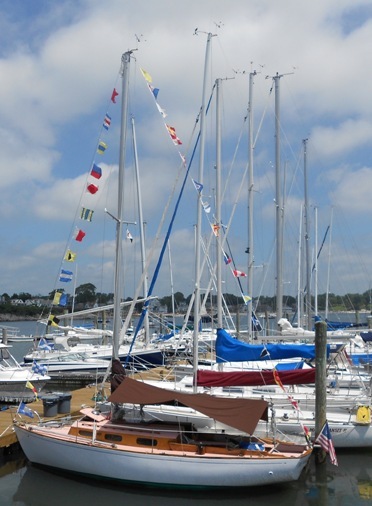 And for more on spinnaker set up and rigging, click here. The mast has 2 turning blocks at the bottom of the mast. 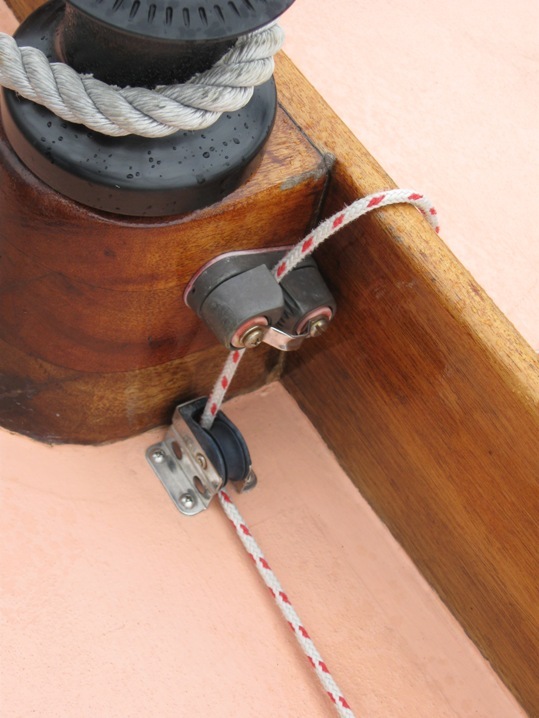 The main halyard and jib halyards can be led through these blocks to cam cleats mounted at the back edge of the cabin top. When racing with crew we use this set up for the spinnaker halyard and topping lifts. 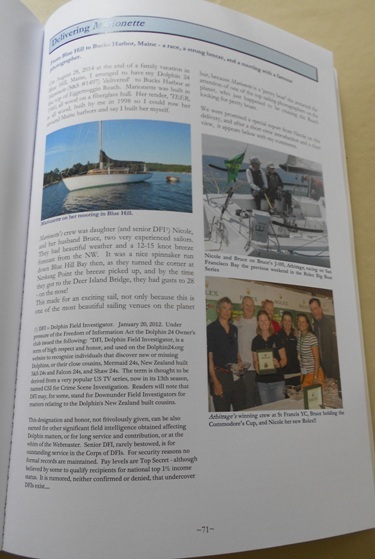 Webmaster Note: This subject of running rigging for a Dolphin spinnaker was brought up on the Forum. Click here for a rough sketch and more detail on Marionette's set up. 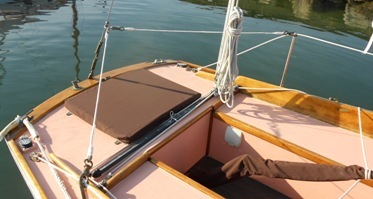 After a thorough inspection of Marionette's single handed set up John came below and had nice things to say about Marionette's traditional interior in white and varnished mahogany trim (see below). Also, I had installed a short inboard track right next to the cabin trunk in line with the shrouds which I think John liked - photo at left. For more on this and jib track generally, click here. 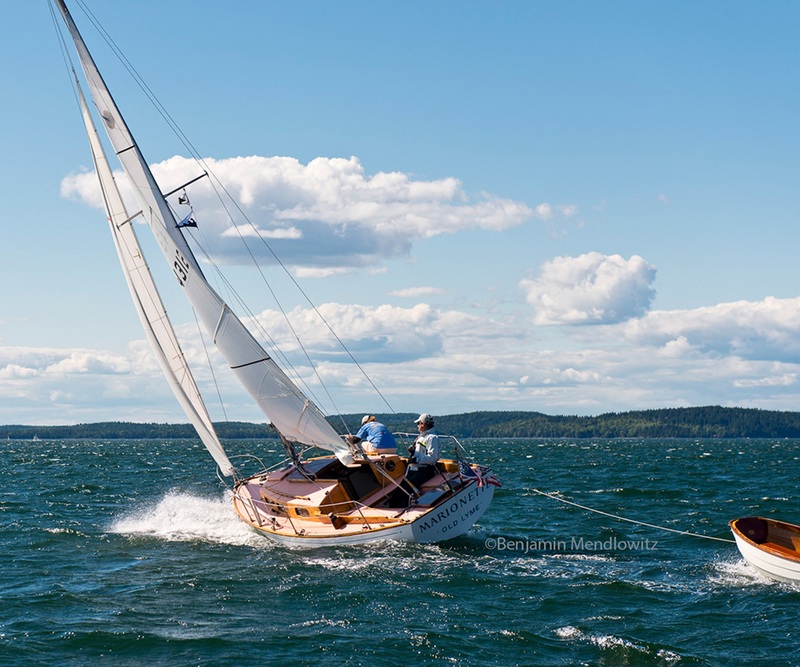 I have a small, heavy cloth, Altantic Class jib (right) that sheets in real tight to a block on this track and is one of my best sails in a breeze – except it is so heavy that I have to roll it to store – a pain in the neck. More on this sail below. Speaking of sails I have a ‘newish’ Farrar Sails built, high roach, long batten main, a light 170% and a heavier 140% genoa – the latter a real workhorse, a small working jib – practically useless when trying to point but nice close reaching, the Atlantic jib , a wonderful high pointing sail (see more on this sail below), and 3 spinnakers. The ‘new’ one is a red monster, a dead downwind maxed sail that Farrar also built. In a light breeze it is like an after burner on a Dolphin. Up forward on the port side (starboard side would be better but that's another story) is a 9’ aluminum spinnaker pole mounted in deck fittings. 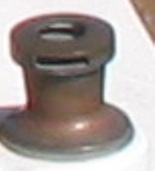 There is also a set of traditional Danforth bronze deck storage anchor fittings, a bronze deck fitting for the anchor line, and another bronze screw type ventilator for the anchor locker. 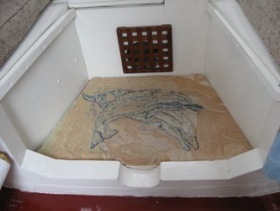 The forward hatch above the forward ‘cabin’ (maybe this term is a bit ostentatious for a Dolphin, after all it is also the head on my boat) is painted the same color as the deck and has mahogany trim. Mounted in this hatch is a solar/battery powered stainless steel vent that runs continuously. It does not have an on/off switch and the fan hum can be annoying at night. 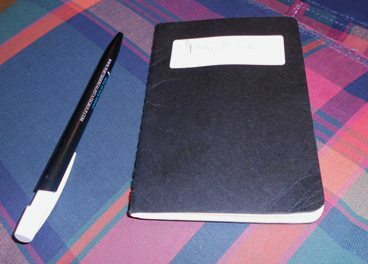 The fix is a ball point pen or anything nearby of the right size, jammed in to stop the fan – this does not seem to harm it in any way. As of July, 2013 its been operating for about 15 years with only 3 rechargeable battery replacements. Deck color – this NOT pink! All this varnish work required the proper background deck color, plus it had to be historically correct. First I removed all the hardware and stanchions, stripped off the dynel, and repaired a few soft spots in the deck. I bonded a thick fiberglass plate under the mast step. 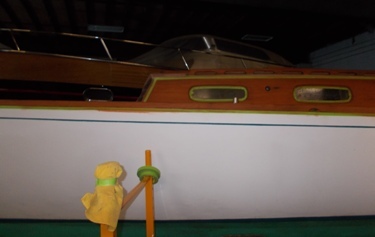 Then I sanded, epoxied coated and resanded the decks and cabin top. Then came the paint job. 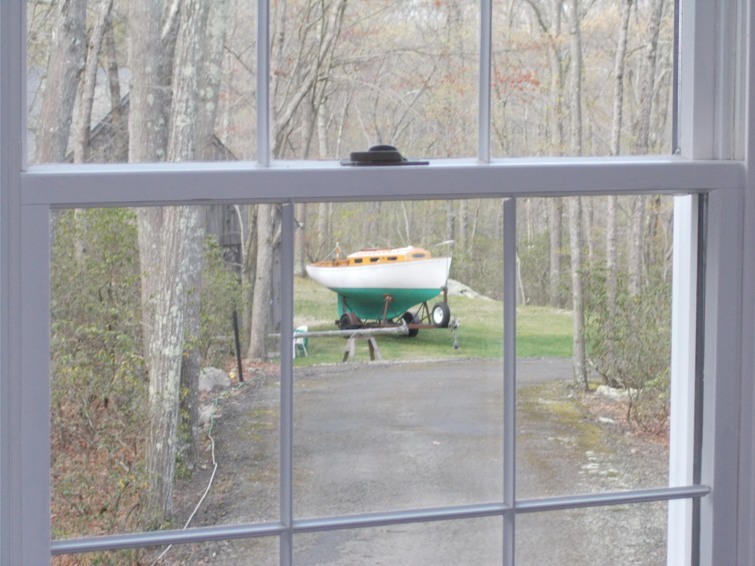 This deck is Red Ochre, patiently researched by the writer at the Blunt Library at Mystic Seaport, based on the red ochre paints the 17th-19th century French boat builders used. This was custom matched and mixed from a high quality Benjamin Moore alkyd enamel base by our local hardware store’s paint dept – as this color is not available at any price from a marine paint supplier – color # 2A23-4 Claret Jug?! Readers of the late Patrick O'Brian's Jack Aubrey series should need not be reminded that, in the wooden boat era, the British Navy always highly regarded a French prize because their ships were so well built, were beautiful to look at, and carried excellent wines…. Before I go below I must say a word about dinghies. I have 2, an inflatable, Pup, and 'TEER, who deserve their own pages. 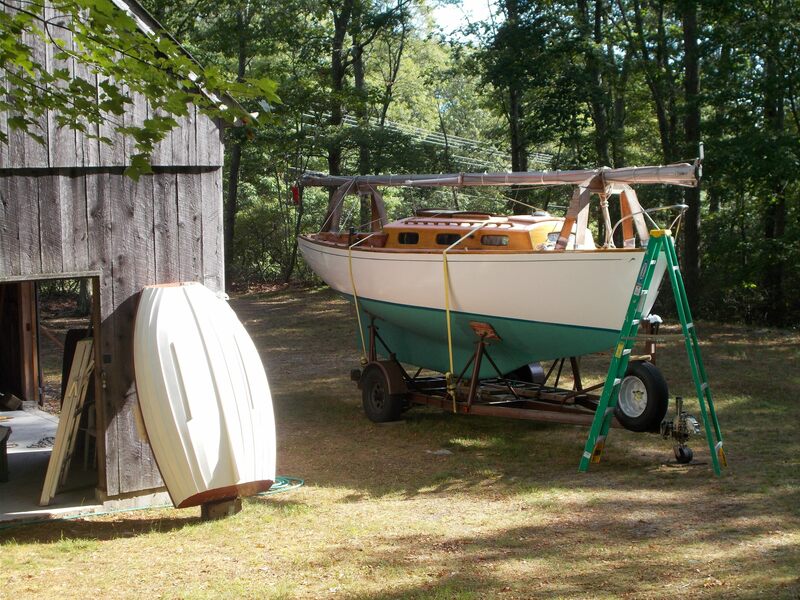 Its one thing to restore a boat, another to build one. I built 'TEER. Her picture is worth a thousand words. Click here to find out more.. Pup would feel bad if did not tell you to click here to see her. Down below, Marionette has a traditional looking main cabin, off white cabin top and hull sides, paneled doors, seats, varnished trunk cabin and trim. The sole plywood is painted burgundy so wine spills don't show. To starboard, there is a small 2 seat settee with a hanging locker forward that I modified to accept shelves – sometimes I wish I kept it as a hanging locker. Please note the blue accents- cockpit throwable cushions that double as back settee cushions here, and the blue denim curtain that separates the two cabins. I modified the settee so it can convert to a small, rather snug, table for 2, or a chart table, or even a table for 4 with its unique leaf system. 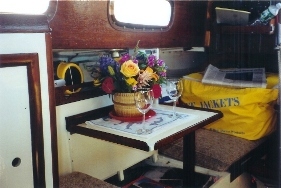 This picture taken from the forward cabin looking aft shows the table. In the foreground to the left is the locker containing shelves that used to be the hanging locker. Click for a larger view of Marionette's Table and lots more details, including the seating for four option - and the entertainment center. 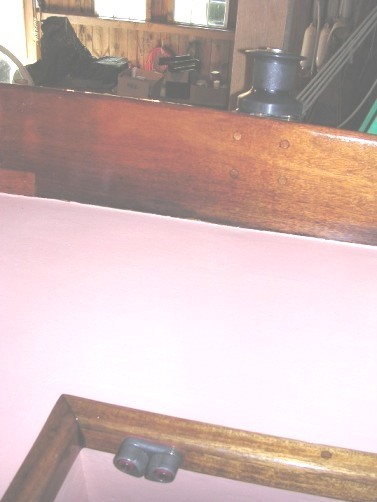 Above the seat backs and galley, on both sides, are shelves with mahogany fiddles. Aft there are 2 quarter berths with lockers below. 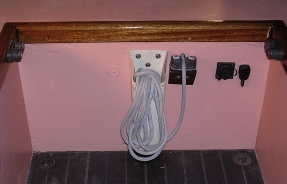 In the starboard side quarter berth locker is a single Group 31, 105A AGM battery (upgraded to a 135 amp gel cell in 2013)and a mounted, but portable, battery charger. (click here to see this set up in detail) I wired 6 cabin lights back to a panel I installed in the bridgedeck. 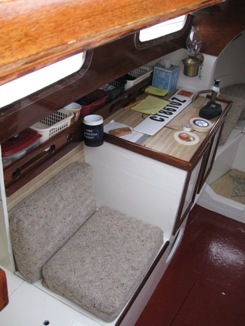 The companionway steps are ingenious - a previous owner built them. They consist of two simple, 1” mahogany boards.The lower board slides into cutouts in the trim pieces on the edges of the quarter berths. The upper board is suspended by large diameter ropes fastened to rings in the bridgedeck bulkhead. 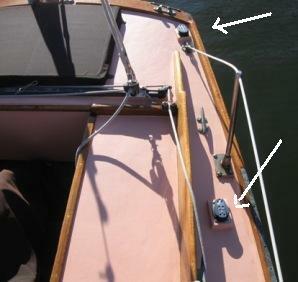 It rests against the bulkhead and the pipe through which runs the centerboard uphaul wire, secured by removable pins. This system is secure, very light, looks good, and is easily removable to access the wide open storage spaces under the bridgedeck and cockpit. Click here for pictures and more on these steps. 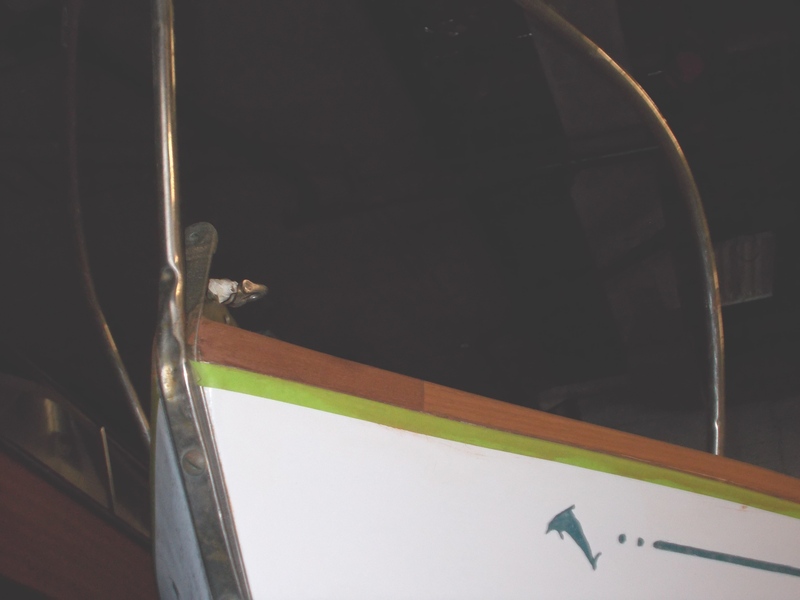 The refrigerator was replaced by your basic removable top, small cooler that fits on the port side under the lower companionway step between the quarter berth locker and the centerboard uphaul wire pipe. 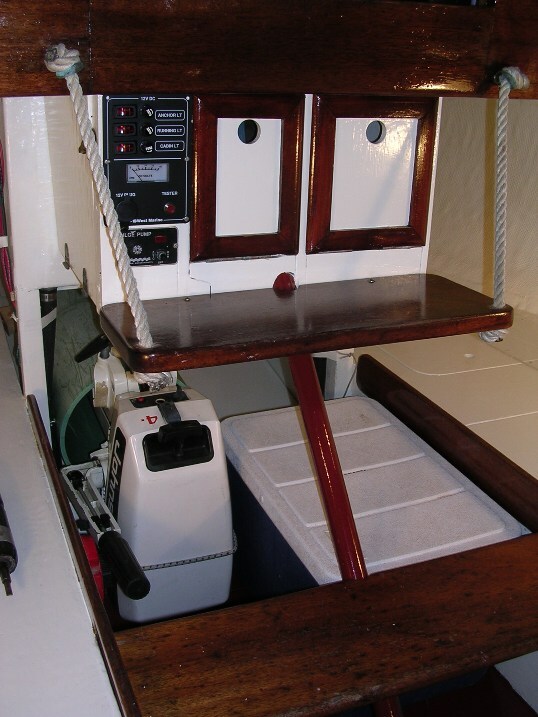 When I got Marionette the space below the bridgedeck and behind the first companionway step was totally open except for the centerboard uphaul winch. 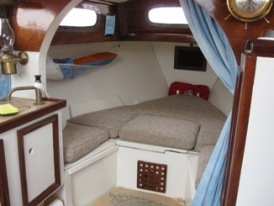 In this space I built a full width multiple compartment locker with panel doors that houses all the boat’s winch handles and extra blocks on the port side, the up haul winch, and an electrical panel on the starboard side. If I had to do this again – and I may – I would have no electrical panel, just a few fused switches. This is the second panel I put in this less than ideal location below the companionway - susceptible to rain and wave spray. I use an oil lamp a lot, and what few cabin lights I need could be local battery powered LED type lights. More on this in a later technical discussion. Click here for pictures of both the cooler and panel. 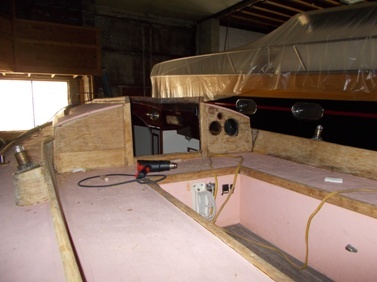 While I had the boat stripped out I took some pictures of the interior joinery that might prove useful for people restoring hi bred Dolphins - wood decks, cabin and cockpit on a fiberglass hull. Click here to see those pictures. 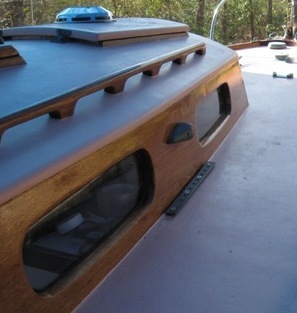 I built a removable partition with mahogany vent louvers to separate the V-berth from the anchor locker in the peak. 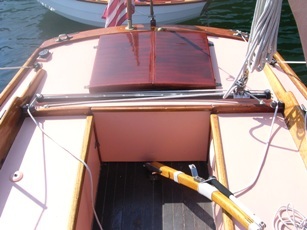 There are full length mahogany trimmed shelves on either side, and lockers below the seats on the aft sides of the v-berth. A heavy denim curtain (faded blue jeans type material) that fastens to one side provides for privacy. This is not a universally admired solution to the privacy issue but I like it. For a larger view and more pictures of the forward cabin as the head compartment click here. I finally got around to getting pictures with the cushions in. Solo, I tuck up on the starboard side, without the inserts. 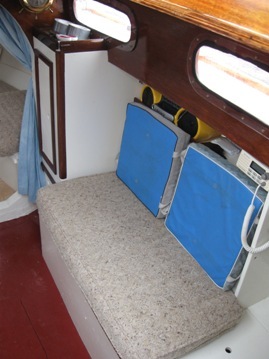 To convert to a king size berth two boards stowed on the sides fit into the opening and the 2 cushions from the main cabin port side seat fit perfectly over them. The 2 eyes staring out are the reflective patches on the medical kit which stores neatly in a small gap at the forward end of the cushions. Its the small things that count. The arcing dolphins hooked hug made by the Admiral fits neatly in the v berth cutout space, and one's toes, upon leaving their toasty warm spot in the sleeping bag, are not discomforted by a cold damp wood sole. 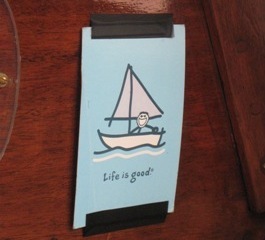 The card received with the tin of homemade chocolate chip cookies made a colorful reminder of what sailing is all about. 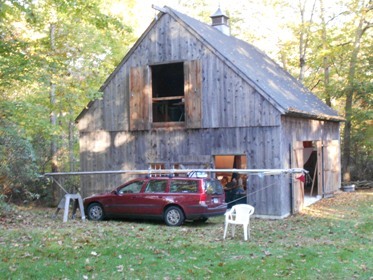 Inevitably, a proper post and beam barn, with a 2nd floor wood shop and a small loft above that, was designed and built. She is on a poured foundation. These are the primary set of doors making up a 10'x10' opening for a Dolphin. 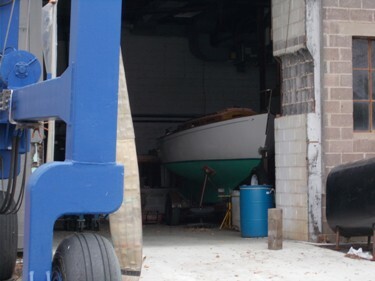 Note the 3 door system.To the left is an 8' x 8' bay which was then occupied by a 51 year old classic wooden runabout very slowly undergoing her 2nd restoration. The third set of double doors out of view, leading out from the second floor, is used for large objects produced in the wood shop behind them - like the afore mentioned most beautiful dinghy. 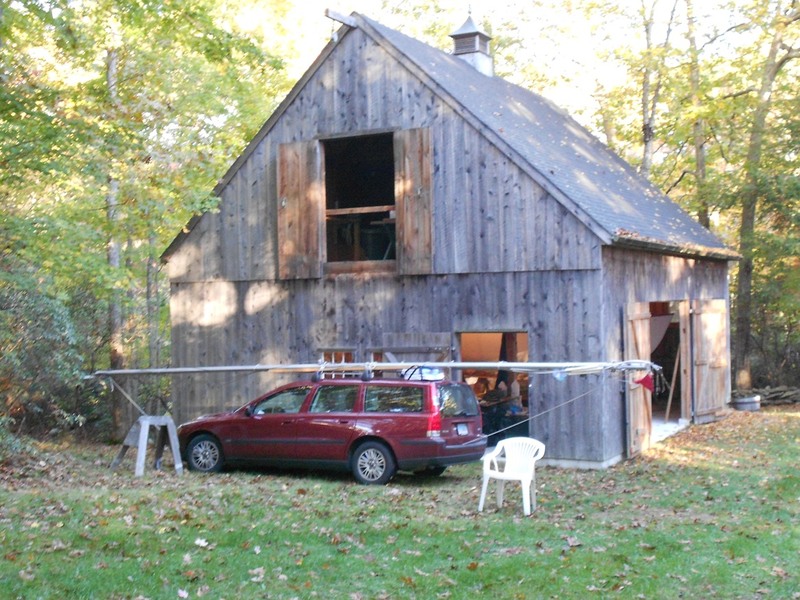 Click here for more Barn. The shop is modestly equipped to suit the equally modest skills of the writer, a table saw, band saw, drill press, large work bench, a grinder, a large table for drawings and stuff - and, naturally, a small refrigerator! 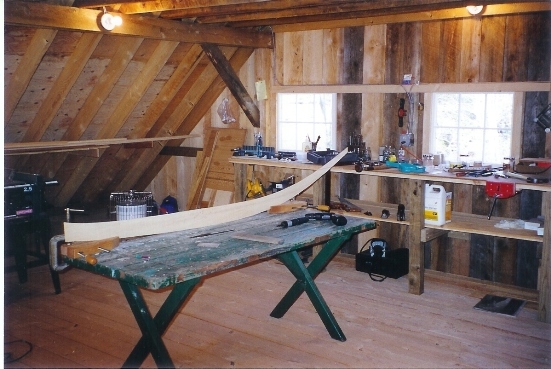 There is a link at left to the Barn, and from there you can link to the shop tools, or you can go to them directly by clicking here. The windvane above it all, is, of course, a copper sailboat. 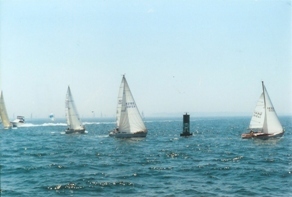 Here she is in one of her her favorite racing positions, leading bigger boats to the mark. 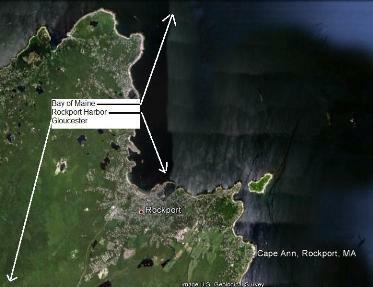 Note the reef. In this recently re-discovered photo, taken at the Off Soundings Club Spring Block Island regatta in 2005, Marionette is in 'Dolphin Country' - in close to a shoal rocky shore with a good breeze. 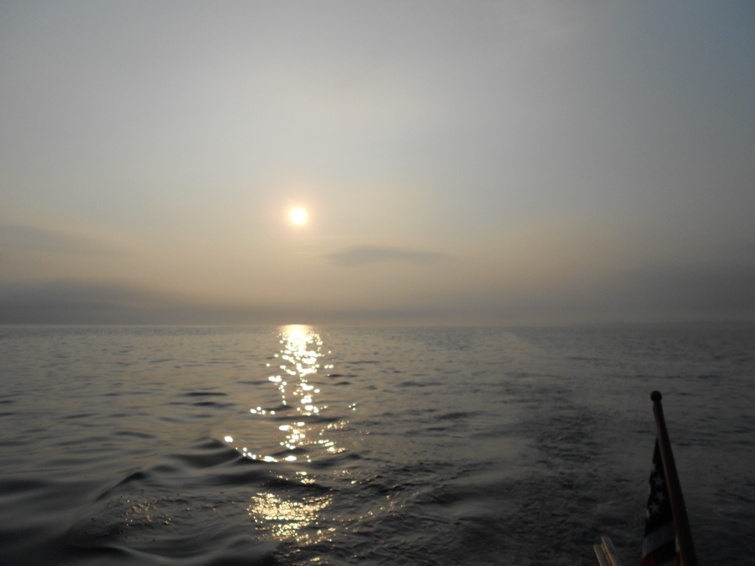 The water is flat in here - outside where the big boats are there's a mean 2-3' chop that Dolphins really don't like! 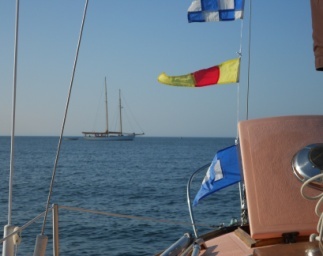 She is moving fast, traveller is down, shorthanded as usual, and she's wearing her Atlantic jib. A friend, who raced on both Atlantics and Dolphins back in the '60s, told me that they used an Atlantic jib in strong breezes on the Dolphin and it worked really well. 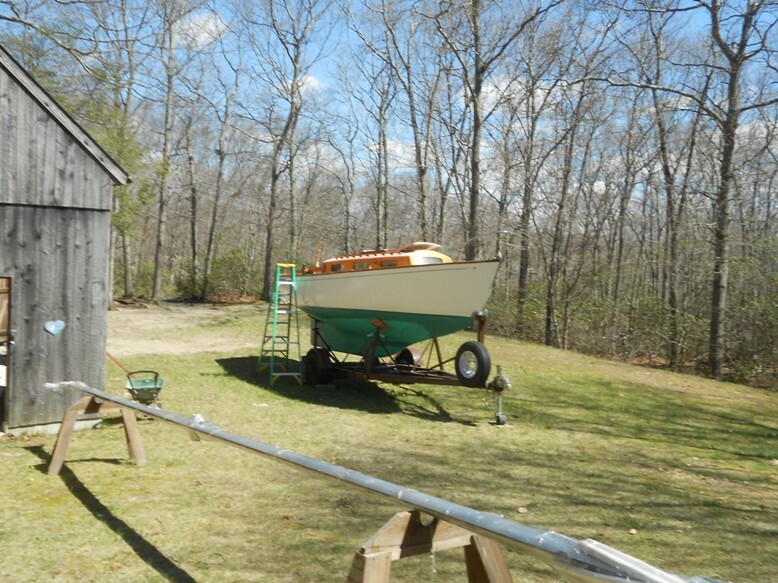 This is an old jib from our Atlantic, Relish A-91, a heavyweight cloth sail, about 7/8ths height on the forestay, with short battens. The sheets lead to a short track inside the shrouds right next to the cabin trunk. 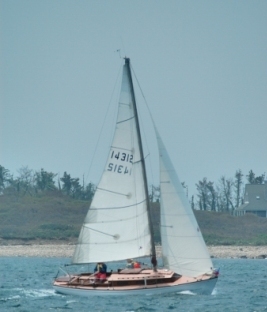 In this photo she is in cruising mode somewhere - maybe Hadley's Harbor in the Elizabethian Islands near Woods Hole. The swim ladder moves around but when placed in line with the shrouds you can pull yourself up hand over hand on the lower part of the upper shroud, thus keeping the water out of the cockpit. More on ladders? Click here. Then a rinse off with solar powered warm fresh water from the black shower bag hanging off the mast, and after toweling off, you walk back all warm and tingly, to pick up your waiting, nicely iced Vodka and Tonic. Nez Pas? Click for larger image. 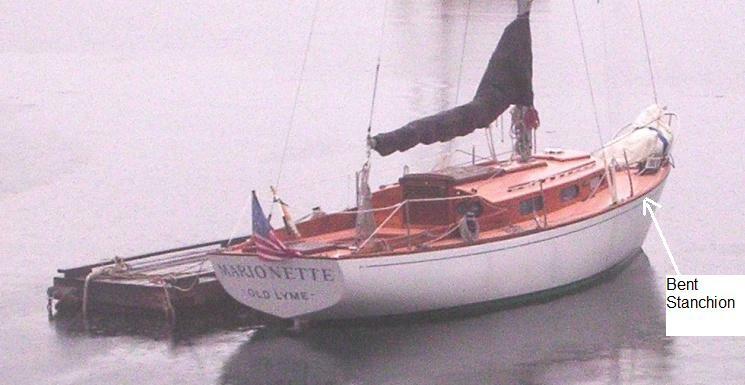 In 2008, Marionette again sailed to Maine - parts of this cruise are covered in a couple of stories in the Stories Section. 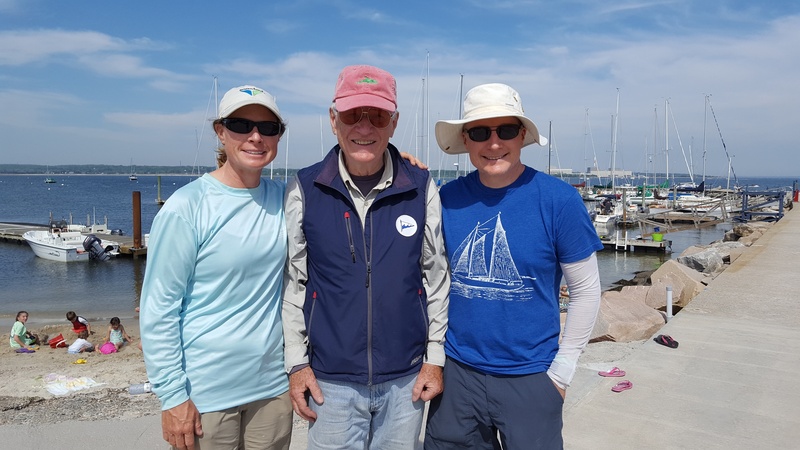 Click here for a story about a repair job that lasted the whole summer, and click here for a story about a meeting with Rod Johnstone and Ragtime. Below is one of my favorite pictures of her, taken of her on this cruise, and currently my moniter background - a foggy morning at Rockport on the tip of Cape Ann, Massachusetts. Someday, I'll collect the notes and photos of this 2008 cruise and have a proper story. 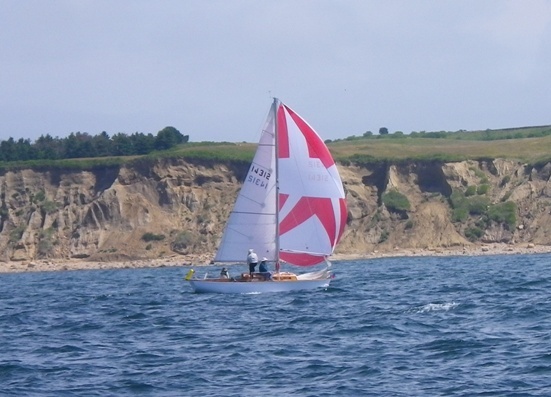 June 17, 2010 Marionette raced and won her Class again in the 2010 Off Soundings Club Spring Series - a 2 race series - race 1 from Watch Hill, Rhode Island out to Block island, and next day, race 2, around Block Island. Race 1 was a drifter, a long day with no one in our Class finishing within the 7 hour time limit so the race was abandoned - probably good for us since we were not having a great race. 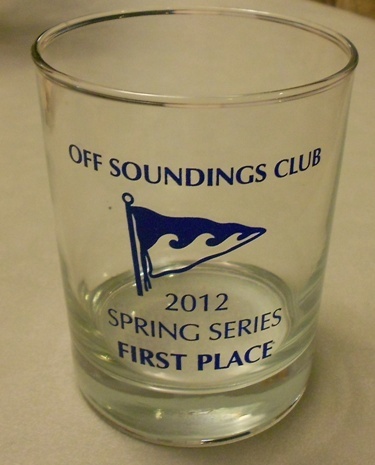 But, at the party, we did not lose the opportunity of accusing our faster boat competitors of luffing up at the finish line to let the time run out as they were justifiably concerned that with the time-on-time scoring our handicap advantage would crush them! 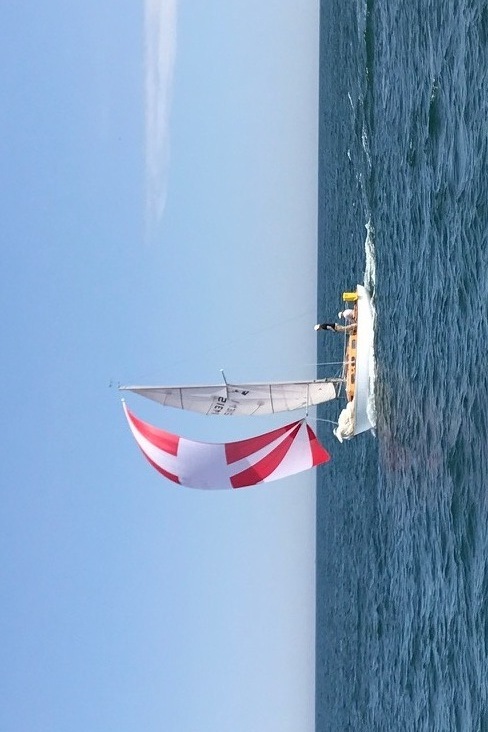 Race 2 on the 2nd day was the traditional Around the Island Race - a 20 mile counterclockwise course in 10-15 knots, going to 18 knots on the last weather leg, bright sunny skies - a glorious Block Island racing day for the 121 boat fleet. 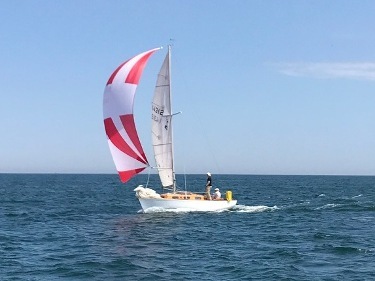 Marionette won her Class by 7 minutes on corrected time, 9 boats including 2 Pearson 30s, 2 Pearson 31s, a C&C 30, a Beneteau 30, a Ranger 26 and a Holland CTM 1/2 ton. In the stronger puffs we had downwind surfing conditions on the backside of the island, nearly broaching on one occasion. We were racing with a crew of 3, your webmaster as movable ballast, pole jiber and worried navigator/parent, helmsperson daughter Nicole, and the main, jib, spinnaker trimmer, big brother, tactician, and all else that needs to be done, son Mike - a better 2 of 3 crew is hard to imagine. Racing short handed in a breeze on Marionette is always exciting. 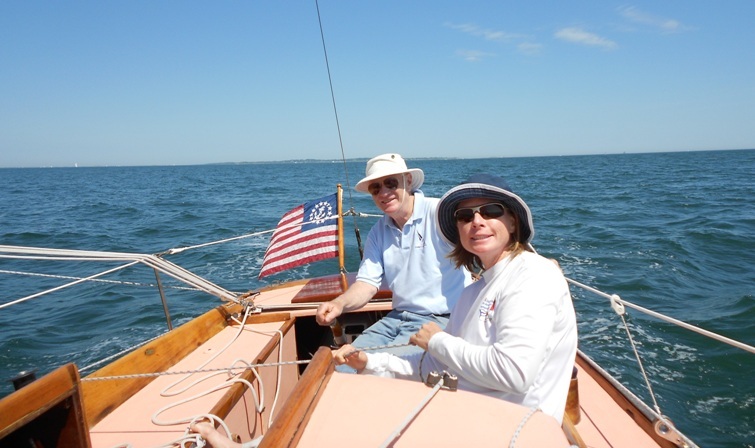 Since we have hank on sails (in the spirit of tradition), choice of starting jibs is important as we do not want to change jibs unless critically necessary. The wind was pretty light so we started with a 170 jib, and used our big red spinnaker. On the last weather leg the wind got up to maybe 18, way too much for that jib - perfect for our 140 in the bag below. The 170 jib has a couple of tack grommets, the highest one maybe 12 inches up the luff so we were able to reduce luff length and sail area some, and we had a single reef in the main. Still overpowered but manageable enough to finish - and win! At the party after the race a number of guys who had owned or raced on Dolphins in the past came over to congratulate - a Dolphin moment! Leaving Block on Sunday, a rainy, foggy day, we lost the water pump on the 4 hp Johnson to what appeared to be a plastic bag sucked into the intake! Naturally, no spare on board. 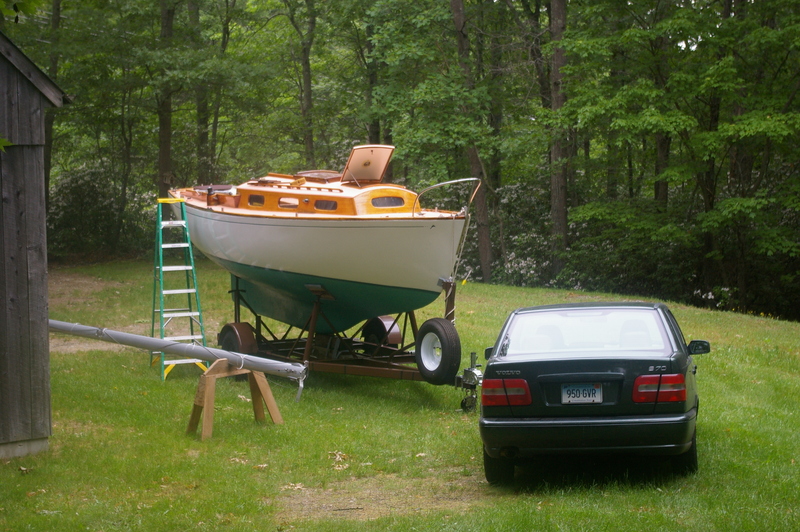 After a couple of hours and the help of the expert mechanics from Class C-6 competitor Tigger, Too, we decided the only thing to do was put Marionette on a mooring, and take the ferry, with motor in hand, get her fixed back on the mainland, and come back later in the week to get her. This story is not yet finished. The water pump is fixed and the motor is running superbly - but leaking water like a lawn spinkler. Seems like the relative gaskets got fried when the motor overheated. 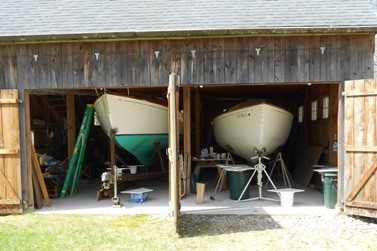 These are special order items from some place in the Midwest so daughter Nicole and I have borrowed an outboard and are taking the ferry back out to Block Island tomorrow and sailing Marionette back to Niantic Bay YC in Connecticut - about 6 hours as the tide is serving.... Stay tuned. 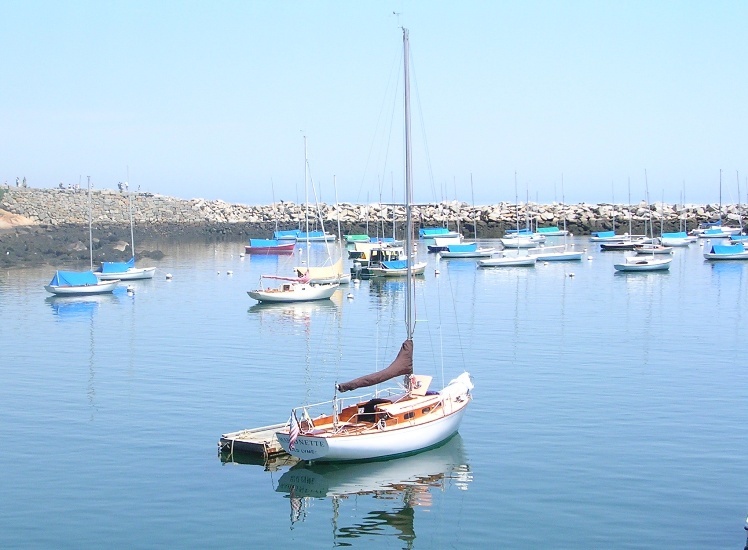 July 29, 2010 - Check out Marionette's Cruise to Newport in the stories Section. July 11, 2011. 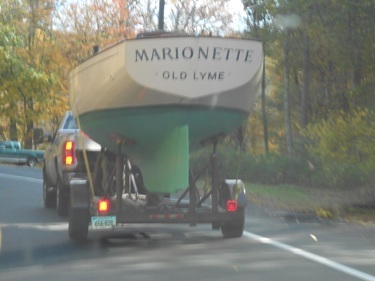 Well, it's a year later and Marionette is finally back in Maine. That ongoing story is covered in the Stories Section, Marionette's Log, Summer, 2011 - click here to go there. This update has to do with the motor issue. We now have a back up. A nearly identical motor, but with a 5" deeper shaft, was found for $25 at a local marine education facility. 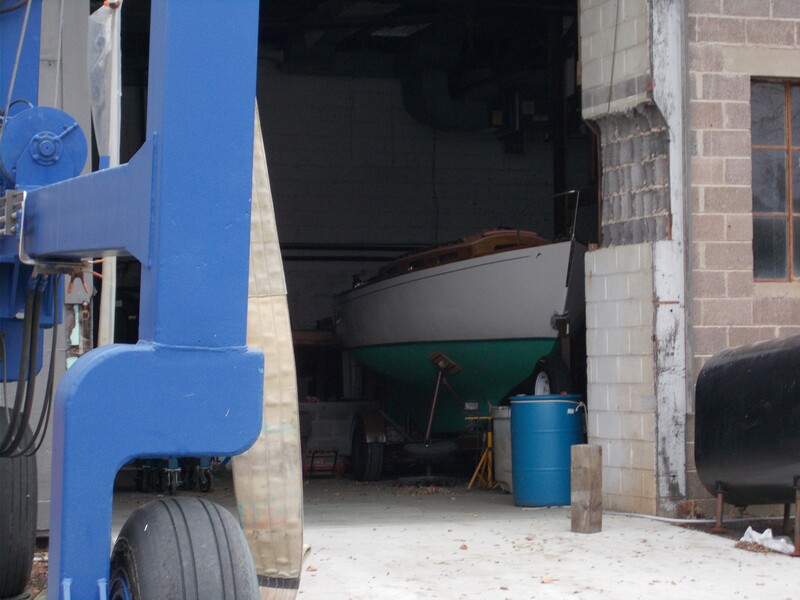 It had been donated to them along with a 22' sailboat. The motor was stored indoors and, while appearing almost brand new, was not running. 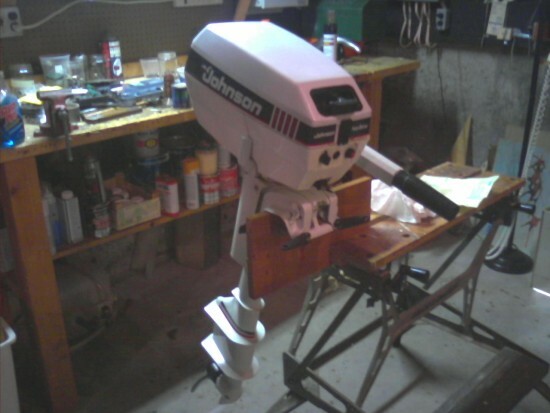 I got it for $25, and spent $400 rebuilding it at the shop that has taken care of my present 15 year old Johnson 4hp. Their comment on seeing the motor for the first time was that it looked almost new. The 'new' engine with its deeper shaft adds 3 lbs in weight (35lbs), but it should provide better top speed performance. We'll see. After a few weeks waiting for parts and inspecting and cleaning the guts, replacing all the gaskets, the throttle control, water pump, etc. I am told its like a new motor. Field trials are scheduled in Maine and a report will be forthcoming. Stay tuned. August 8, 2011. I'm sure many have been waiting for news of field trials on the above motor - and this report is overdue. Basically, trials were successful. 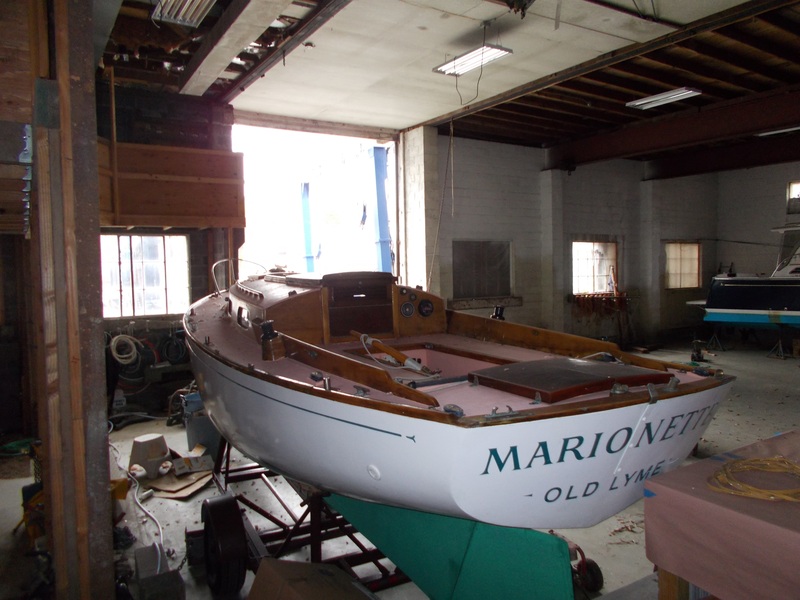 The "new" motor drives Marionette at least 1/2 knot faster than the original motor! And there have been additional developments including the acquisition of a 3rd motor. Click here to go to Marionette's motor page. 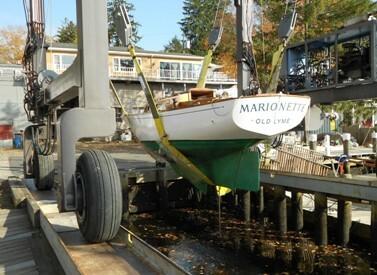 September 28, 2012 update - new sea trials indicate that this longer shaft motor drives Marionette nearly 1 full knot faster than the short shaft. Details are covered on the Motor Page. September 19, 2011. 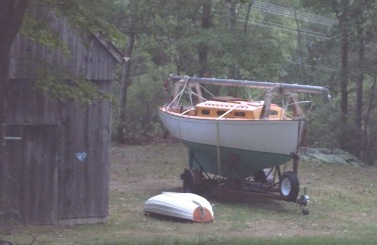 Marionette, ready to be hauled at the end of her shortened 2011 Summer Cruise. 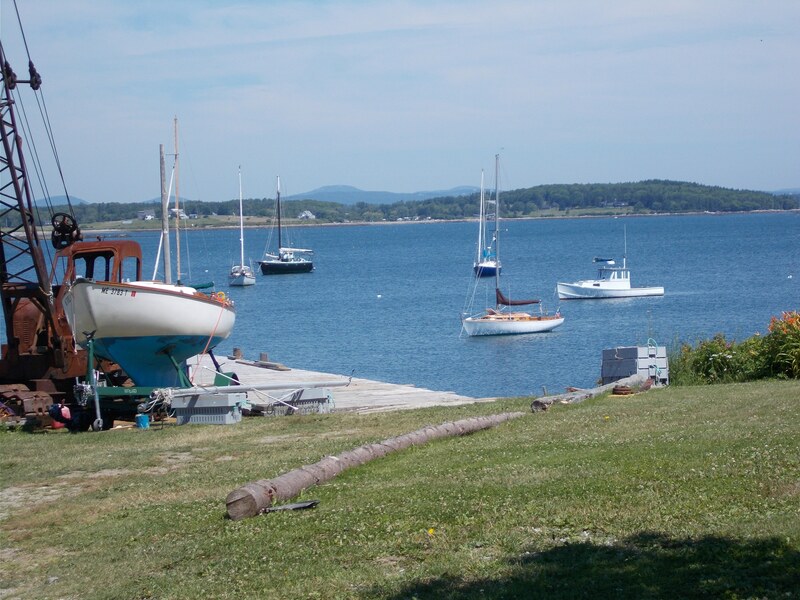 Flawless work, again, by the yard crew at Journey's End Marina in Rockland, Maine. 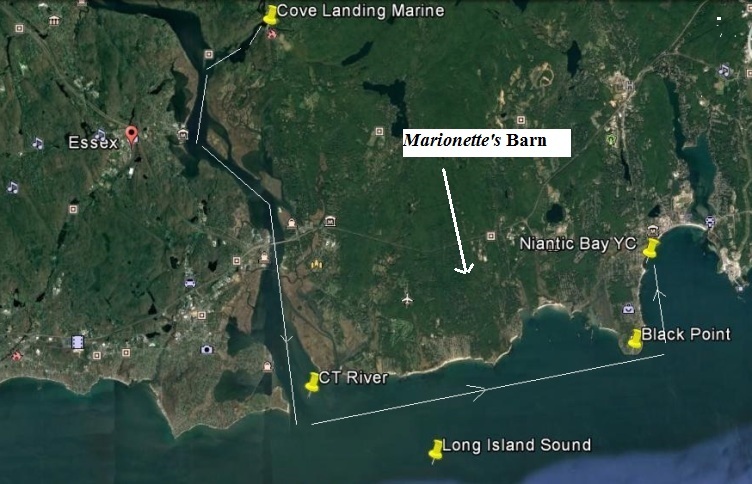 That story was covered in the Stories Section, Marionette's Log, Summer, 2011 - click here to go there. April 10, 2012. The winners of the 2009, 2010 and 2011 Sparkman & Stephen's Association Global Challenge Trophy were announced. 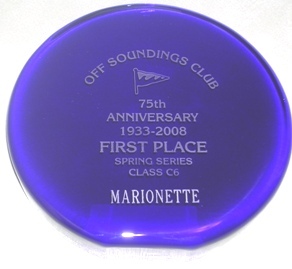 Marionette was named winner of the 2010 Trophy for her win in the Off Soundings Club Around Block Island Race held in June, 2010. In 2009, Marionette finished 2nd (to Dorade!) in this international competition. 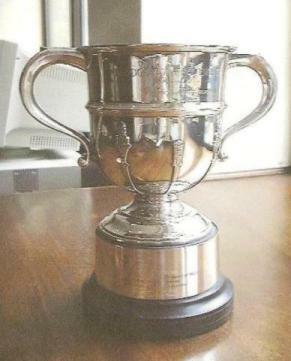 Normally, winners of this trophy are announced at the S&S Association Annual General Meeting (AGM) in the year following the year raced. The Trophy (see picture at left) will be engraved with the winner's names and presented at the Association's 2012 AGM in Dyvig, Denmark, May 10-13. For more on this Trophy click here. 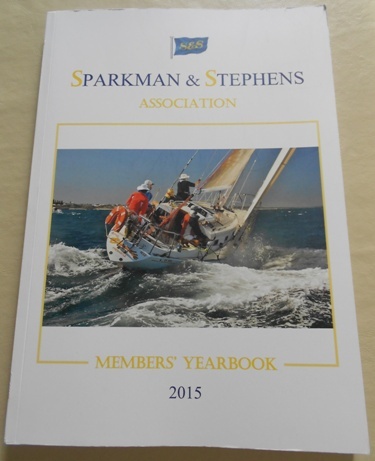 What do I have to do to join the 'Association' ? My son just bought 'Passage' O'Day Hull Number 10. June 12, 2012. 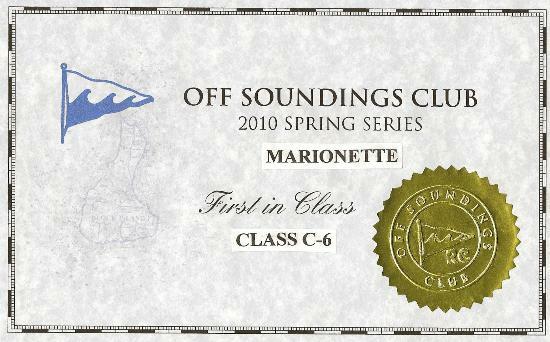 Marionette won her class again in this year's Off Sounding Club Spring Series. This was a light air event - which are a Dolphin's favorite conditions. The regatta had a great turnout - 138 boats in 12 classes. October 1, 2012. 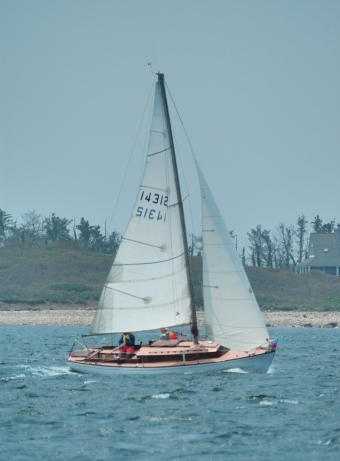 It's been a quiet summer - after racing in June we had a little bit of day sailing, nothing exciting, no more racing, no Maine cruises..... but Marionette decided to close out her 2012 season on a high note. 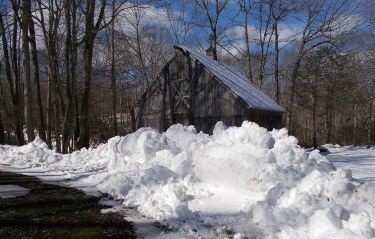 February 13, 2013. A lifeline stanchion replacement project is completed and detailed in the Technical Section. Click here to go there. June 3, 2013. Ok, its a new season for Marionette with lots of probably overly amibitious plans. 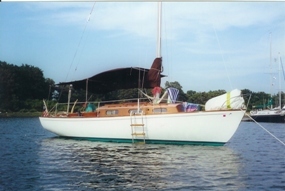 The feature will be a delivery/cruise up the New England coast to Maine in late July, day sailing in August based at Bass Harbor on Mt Desert Island in Maine, some short 2-3 day Fall cruises in and around Penobscot Bay, and a decision yet to be made about keeping her up there over the winter for a full season in Maine in 2014. It all has to start somewhere. Here is Marionette's start a couple of weeks ago - her first trip this season. Somebody has to do it!! 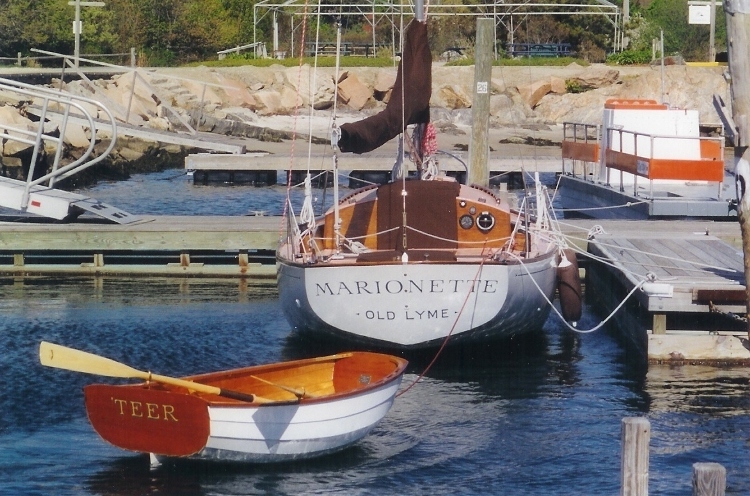 Marionette was unofficial greeter to famous Mystic Seaport schooner Brilliant overnighting in Niantic Bay. July 9, 2013. 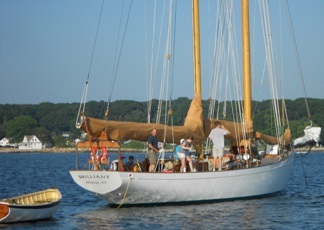 The broken centerboard winch functionally, if not yet cosmetically restored, (see story here http://www.dolphin24.org/technical_cb%20winch.html) Marionette left Niantic Bay July 8 for a short, 10 mile mini shake down overnighter at West Harbor, Fishers Island, New York. 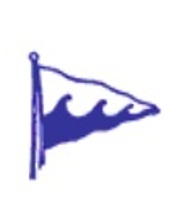 Nice morning breeze, 10-15 knots, broad reach, arrived Fishers Is Yacht Club docks at 11. After lunch (this time I bought!) Peggy and I conducted an extensive review of various Dolphin matters at the Fishers Island Library, making good use of their large screen computer monitor. August 3, 2013. 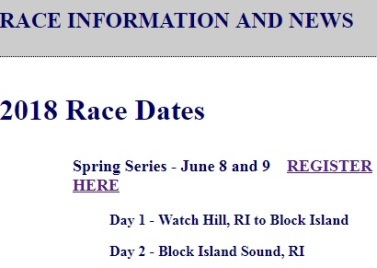 Well, the Maine cruise is off and the operative phrase is "wait 'til next year". 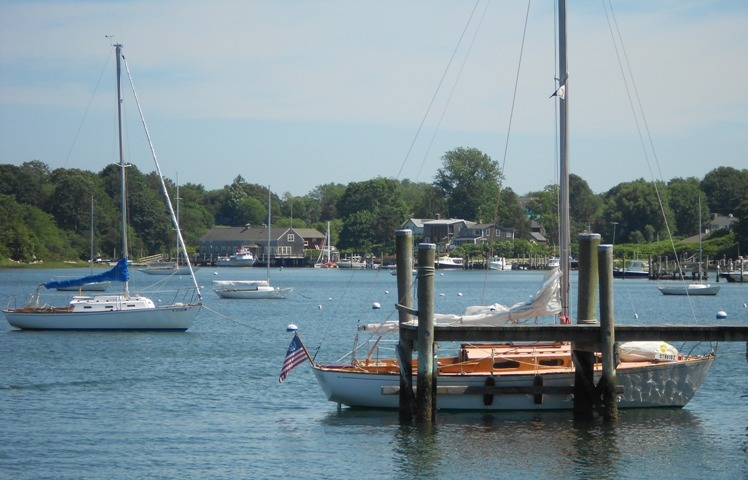 A quick overnighter across Long Island Sound to Greenport and Shelter Island, while not exactly a 9 day cruise to Maine, helped ease the pain. Sept 8, 2013. The pressure on a webmaster to keep a log is relentless. 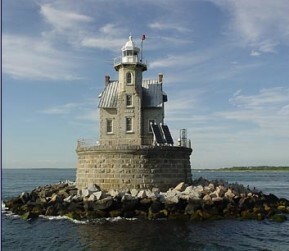 Even the short trips can hold interesting stuff especially if you keep a camera in the cockpit, and a picture is worth 1000 words.. Click here for 2 day log on Marionette's short round trip trip from Niantic to Stonington, Connecticut at the east end of Fisher's Island Sound. September 11, 2013. We put up a short story tied to Dolphin 24 model building. Click here to go there. Colors not quite at peak yet - hauling too early? July 3, 2014. Given the number of sister ship updates received so far this Spring it seemed in order to have your webmaster provide a Marionette update. She is not yet in the water - she is undergoing a 'major' refit in the barn based on the partial list appearing above. 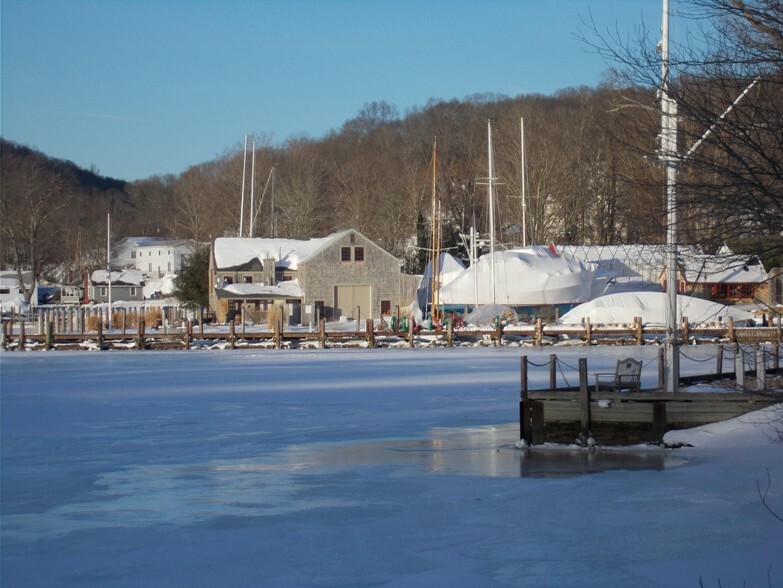 We have taken a one year 'sabbatical leave' on her slip for this season at Niantic Bay YC. 'The Plan', this year, is to trailer her up to Maine in late July for an August/September season there. July 11, 2014. (some) photos, as promised, plus an update. Webmaster Note: 8 days to wait for photos might seem like a long time but some of you guys make us wait for years! Marionette makes me keep a little black book in which my chores are listed and checked off when done. Still more unchecked than checked. She is out of the barn so I was able to wash her and the trailer and she would let me take her picture. The picture below left is taken at the proper reasonable distance so as to be sure and pass any painting examination by those dubious of my hand brushed finish. An exception is the close up of the O D - not as nice as Bill Thomas' Ruby but then he's a pro. October 9, 2014. 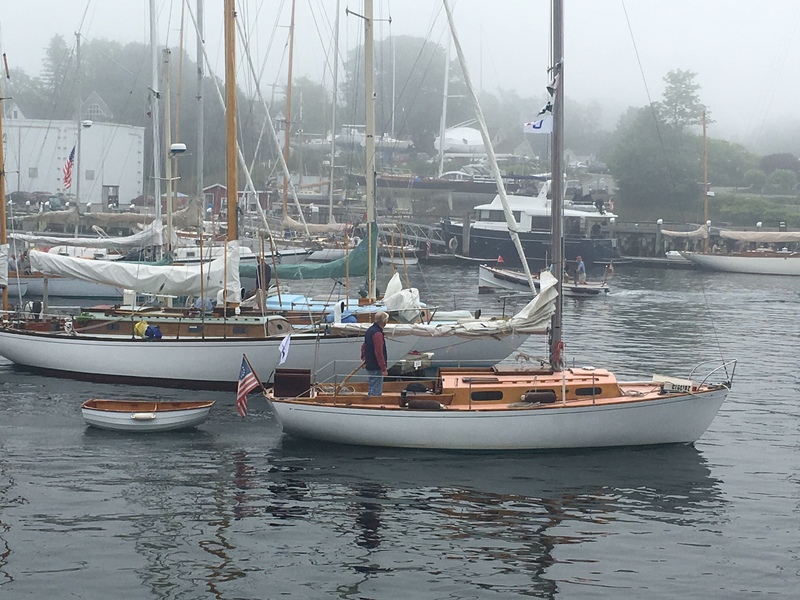 Marionette was delivered from Blue Hill to Bucks Harbor, Maine on August 28 by Senior DFI Nicole Breault and husband Bruce Stone. This delivery is captured in the Stories Section - click here to go there. 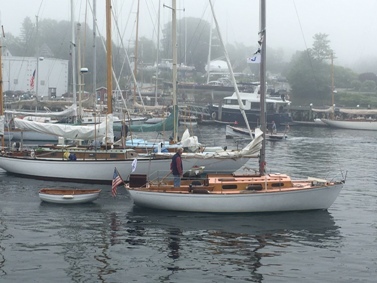 They had strong breezes on Eggemoggin Reach and while tacking back and forth near the top end of the Reach they attacted the attention of famed Calendar of Wooden Boats photographer Benjamin Mendolwitz who sent us the following picture. May 7, 2015. Launched, Marionette's 55th year - and she got a 'pretty boat' from Paul, the yard manager. Click here for a short pictorial in the Stories Section (updated May 15, 2015). June 15, 2015. Marionette wins her class, again, at the Off Soundings Club Spring Regatta, Block Island, Rhode Island. Click here to see the report in the Stories Section. July 27, 2015. 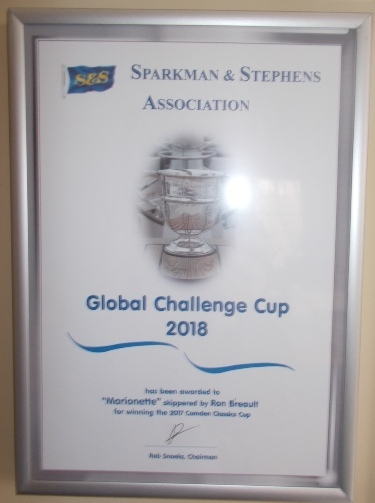 A couple of days ago, we received the S&S Association invitation for submissions for the 2015 season Global Challenge Cup trophy to be awarded in 2016. 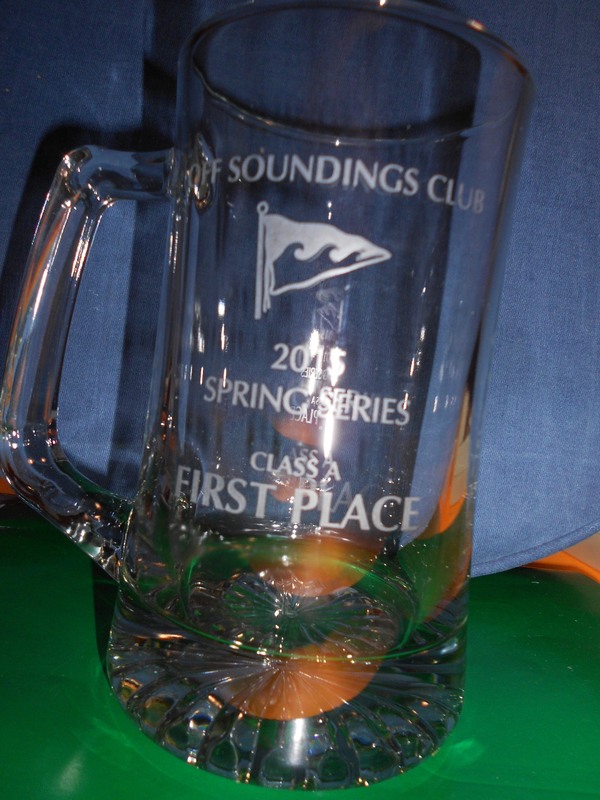 Marionette would feel bad if we did not submit her Off Sounding Spring Series results. So we did - stay tuned - the winner will be announced early next year. Click here to see the submission. April 14, 2016. We received the following email announcing Marionette as the winner of the 2016 Challenge Cup award. Here is the link to their website page covering this announcement. 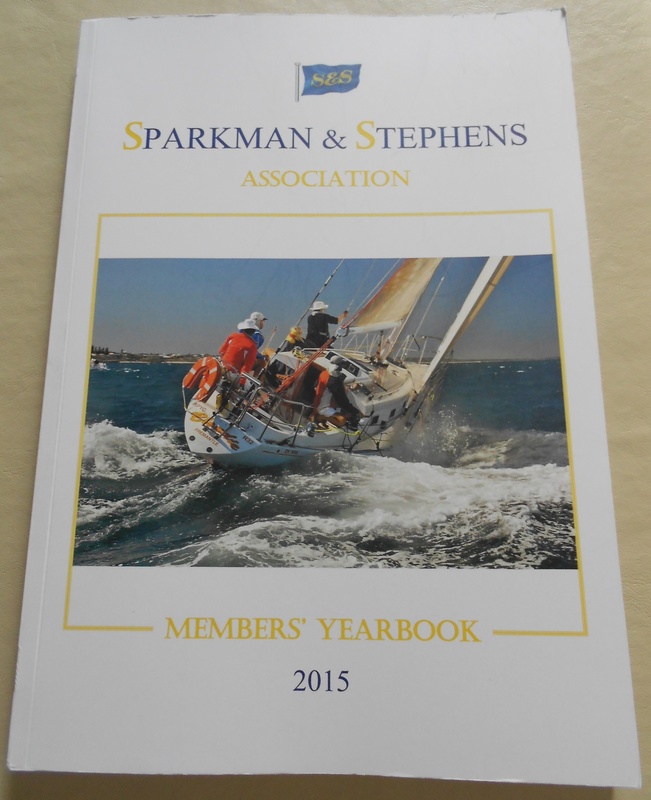 http://www.sparkmanstephensuk.info/page100.html. Regular readers of this page know that this is the second time Marionette has won this award. 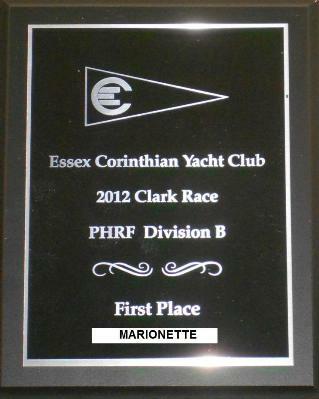 Click here to go to check out the Global Regatta and Marionette's results over the past few years. The final results for the Global Regatta 2016, based on races sailed in 2015, are now ready. The presentation of the Challenge Cup will take place at the AGM in Lagos Portugal, May 22-22. It would be a pleasure if you all could be there. The announcement to the membership will be later this week, but I wanted you to know before the publication. It is a strong motivation and source of pride to see the S&S yachts still going strong. I thank you for your commitment and great example to us all. This article refers to another article later in the yearbook submitted about Marionette. Click here to go to it. June 7, 2016. 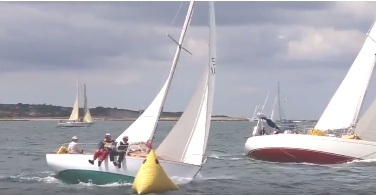 This great photo of Marionette racing at Block Island in the 2015 OSC Spring Series appears on http://dolphin24.org/marionette_osc_spring_series.html, and deserves to be here on her home page as well. July 15, 2016. 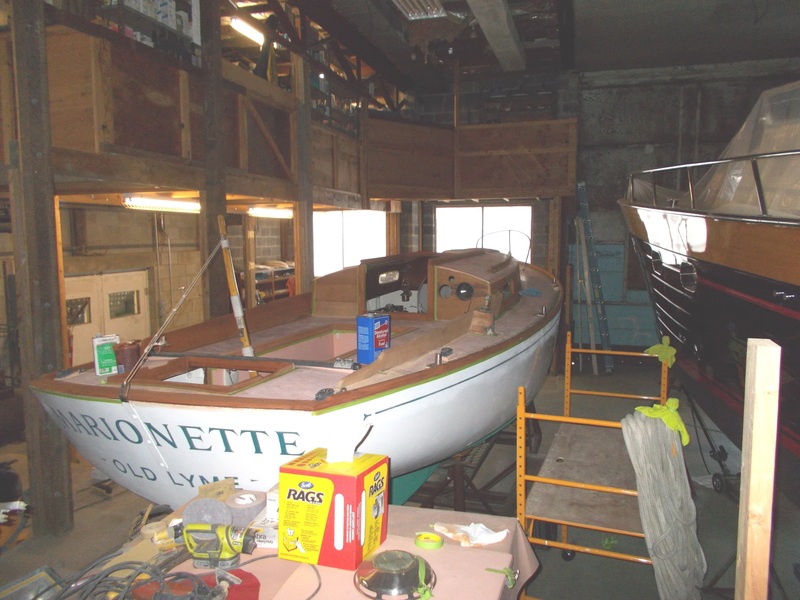 Enough already with Marionette's 2015 doings - the 2016 season is here, admittedly a bit of a late start, but she is now in Maine and her 'log' is is process. In a couple of days we'll have a link to the beginning of that log but for now we have a couple of photos to put here. Webmaster Note July 17, 2016 - Click here to go to Marionette's Log, Summer, 2016. September 26, 2016 Faithful readers of Marionette's log know she got back from Maine the 1st week in September. 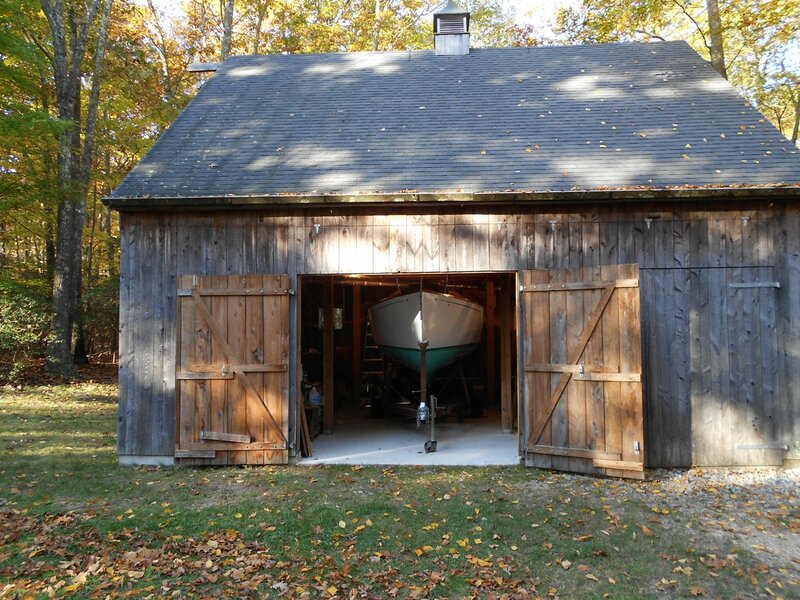 Here at right she is waiting to be stripped of all her gear and sails (to be properly cleaned and stored) ; hull and deck washed, mast washed/WD40'd/wrapped and stored; 'TEER moved to the 2nd floor in the barn; Move her into the barn; winterize her - all DONE!. April 30, 2017. Time to get to work. Moved her out of the barn and washed her yesterday. When she's out of the barn she knows we are on a short leash - I can't forget her because I have to drive right by her, and also I get to see her non stop from the house windows. May 26, 2017. 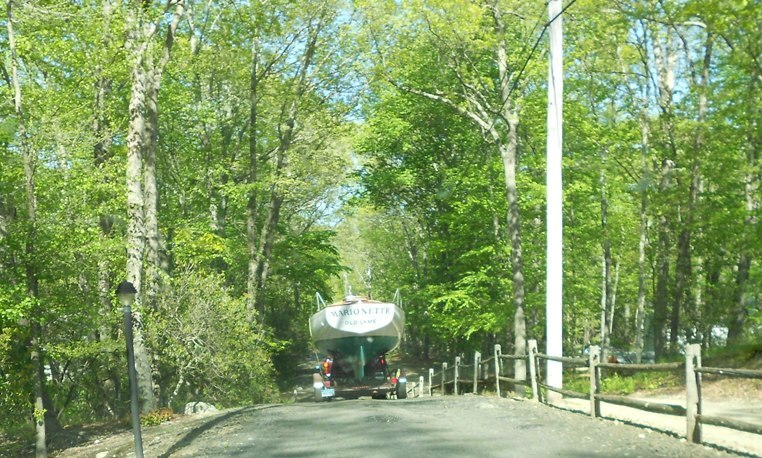 Well, best laid plans of mice and men...... Trailered her the 5+ miles from her barn to Cove Landing Marine in Hamburg Cove on Sunday, May 14 (Yep - Mother's Day...) Got mast stepped and launched on May 18. We had heavy rains, needed a new battery ($278! ), had electrical panel problems carried over from last season, replaced burned out Auto Tiller Socket ($47 - Otto was pleased), outboard #1 cover fitting problem (update inTechnical Section), etc., etc..... 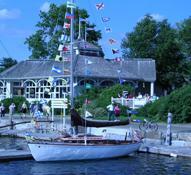 Finally left Hamburg Cove, Tuesday May 23, at 8:30AM, arrived NBYC at Noon - motor sailing, main only, the whole way. 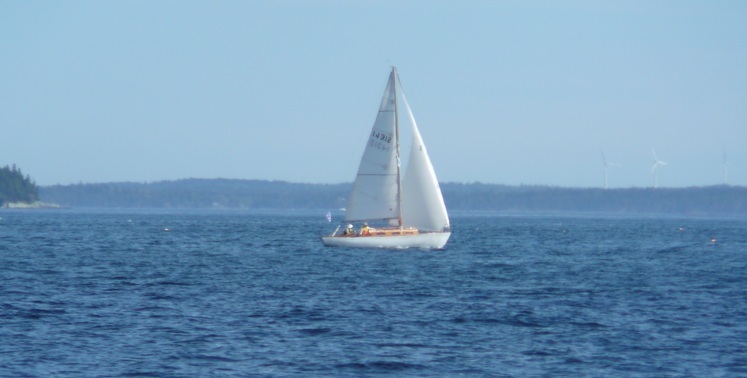 Ron - I was sailing aboard Brightside (Elan 31S) when we sailed near you on the east side of the island. The boat looks (good) and it was moving well. Hope that you had a good weekend. 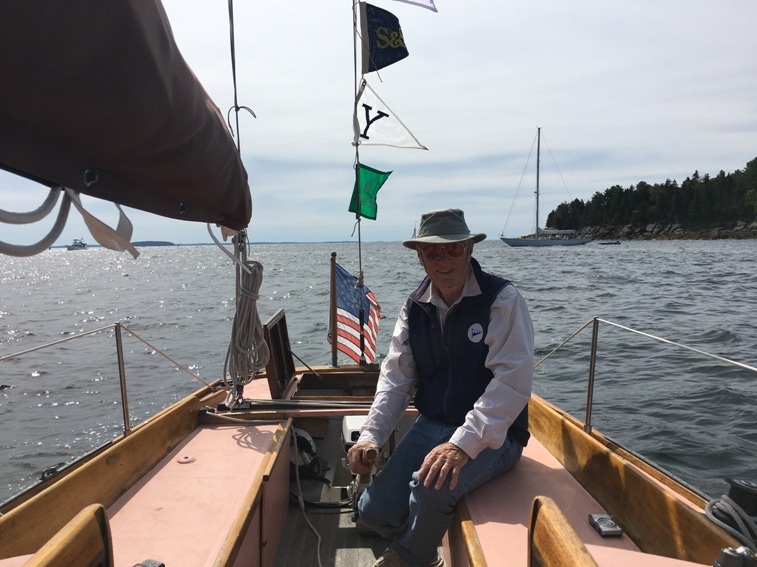 And, Brian Connelly, a crew on Senshin, a Center Harbor 31 (Brian is looking to buy his own Dolphin!) 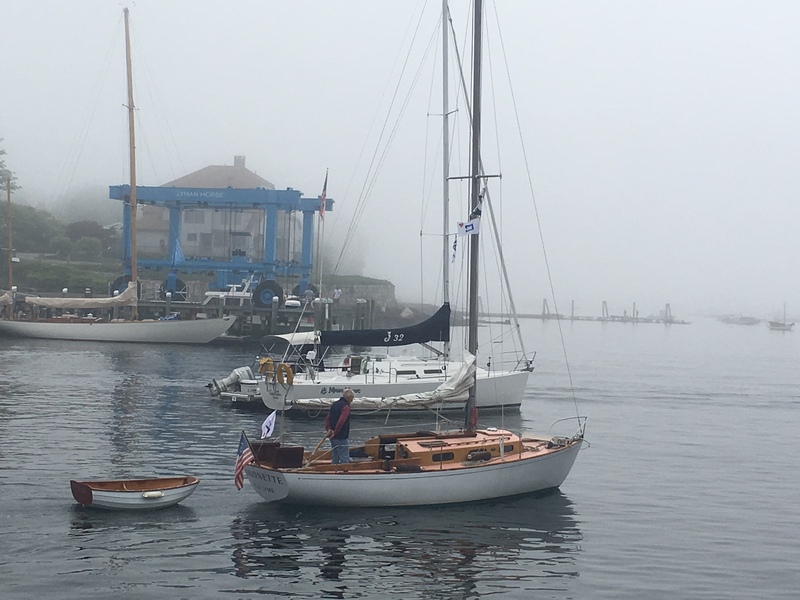 , sent in these 2 photos of Marionette leaving Camden harbor on August 4 for a very foggy trip to Rockport where she was being hauled for her road trip home. Click the photos below for a larger image. Postscript photo - added November 14, 2017 This photo below appeared in Marionette's Log, 2017, and re-surfaced today in a 'TEER page update. Website staff thought it also should be here on Marionette's page. 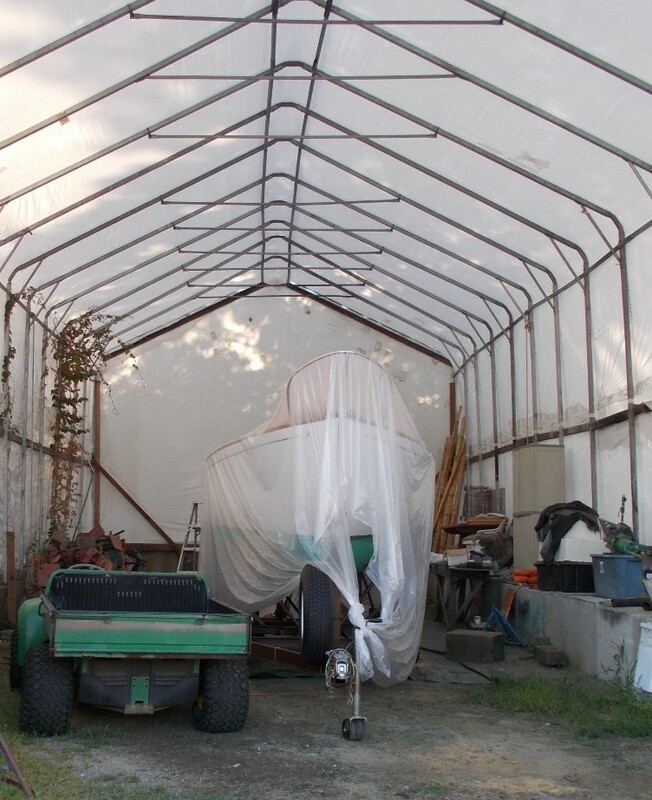 November 5, 2017 - Update, she has been moved from the shed to the shop (right). 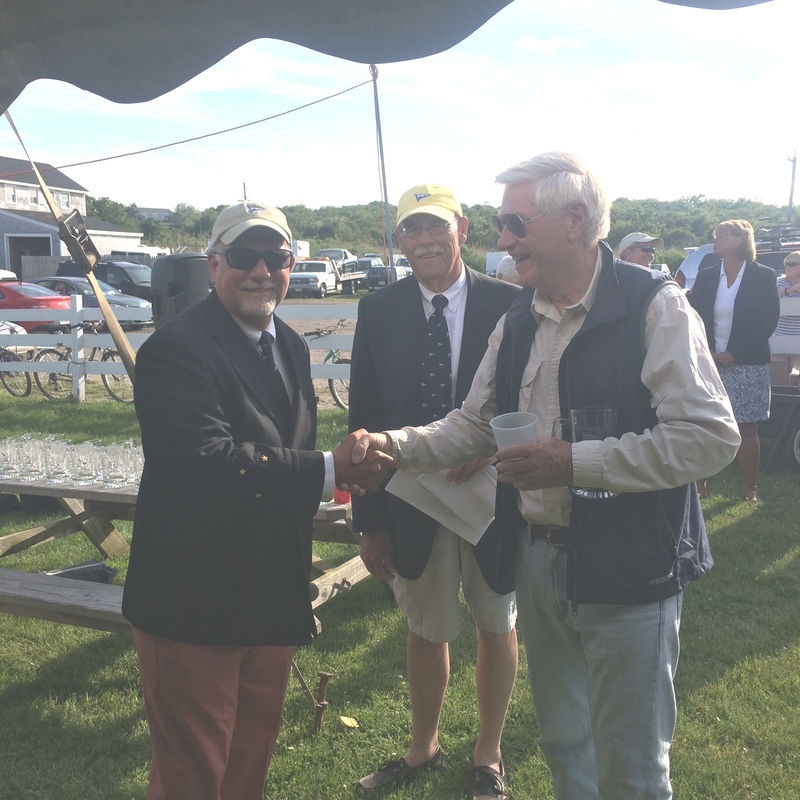 April 6, 2018 Just in over the transom - Marionette wins the 2018 Global Challenge Cup - for the 3rd time!!! Click here for the details. May 3, 2018. Marionette's racing plan for 2018 is taking shape. Entered! 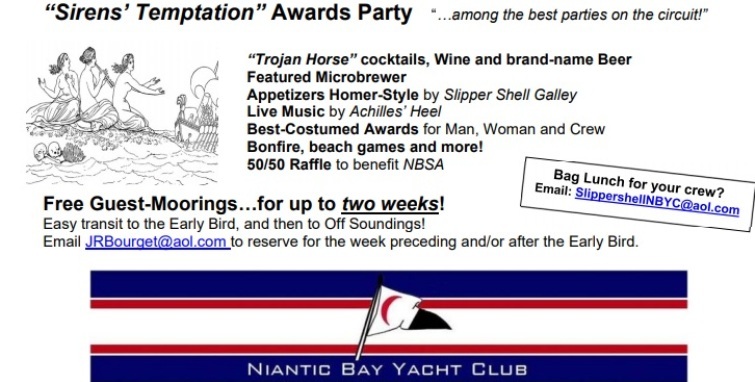 Marionette's homeport, party time!! Dolphins welcome! !